Beer bottles were of thick glass also since they had to be able to survive extensive post-bottling handling and use since these bottles were typically re-used many times, as evidenced by extensive base and side wear to many examples. In fact, similar to soda/mineral water bottles, many (most?) beer bottles were the property of the beer bottler and were sometimes marked as such, i.e., THIS BOTTLE IS NEVER SOLD or similar words to that effect (Paul & Parmalee 1973; Busch 1987). Click on This Bottle Is Never Sold to view this type of embossing on a St. Louis, MO. 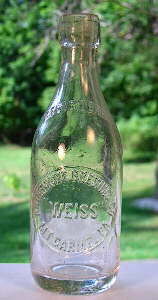 weiss beer bottle from the very early 20th century. 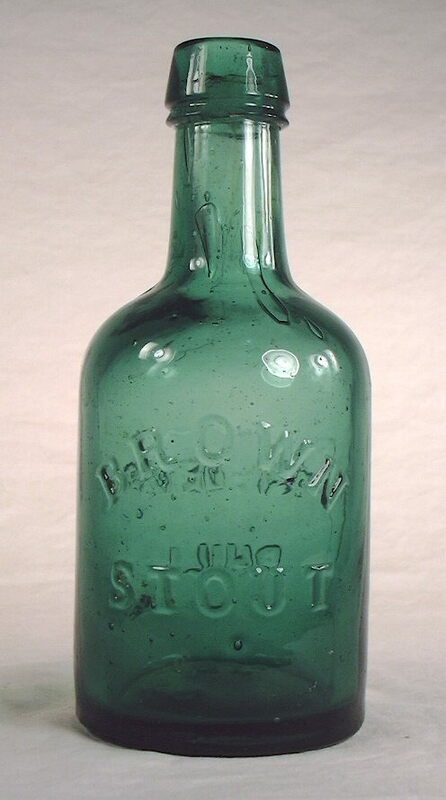 Another limiting factor to beer/ale bottle variety was that a large majority of the bottles produced during the period covered by this website were in some shade of amber, aqua, or colorless glass, with earlier (pre-1870) bottles tending towards some shade of green, olive green, black glass, and aqua. Other colors - including cobalt blue - are unusual but occasionally seen. Beer and ale - and the related stout, porter, and weiss - are the yeast fermented products of various grains, most commonly malted barley and/or wheat. (Note: All four of these very similar products are lumped together and referred to simply as "beer" in this section.) Beer brewing began in the U.S. during early colonial days when beer was consumed in large quantities on all sorts of occasions and during almost all meals. However, using bottles to contain beer was uncommon during that time as beer was dispensed from kegs in taverns and inns and bottles were relatively rare and expensive. The types of bottles used for bottling beer in the earliest days would have been the common heavy glass black glass utilitarian bottles of the era which were used for various liquid products. By the late 18th century, beer was being bottled in the northern Atlantic seaboard states in various black glass bottles in enough quantity that some was being exported (Munsey 1970; McKearin & Wilson 1978). 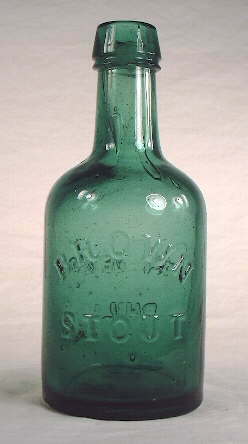 By the second quarter of the 19th century, beer (and the related soda/mineral water) bottles began to evolve a style of their own though "strong, heavy, and black" bottles continued to be used for beer bottling up through at least the late 1870s and even until the early 20th century with imported bottles (Wilson & Wilson 1968; McKearin & Wilson 1978). However, until the early 1870s the lighter lager beers were a relatively unusual bottled product nationwide. When bottled it was mostly for local distribution due to the issue of spoilage, though the heavier beers (porter, ale, stout) did preserve better than lager due to higher alcohol and hopping levels, both of which acted as preservatives (Wilson 1981; Papazian 1991). 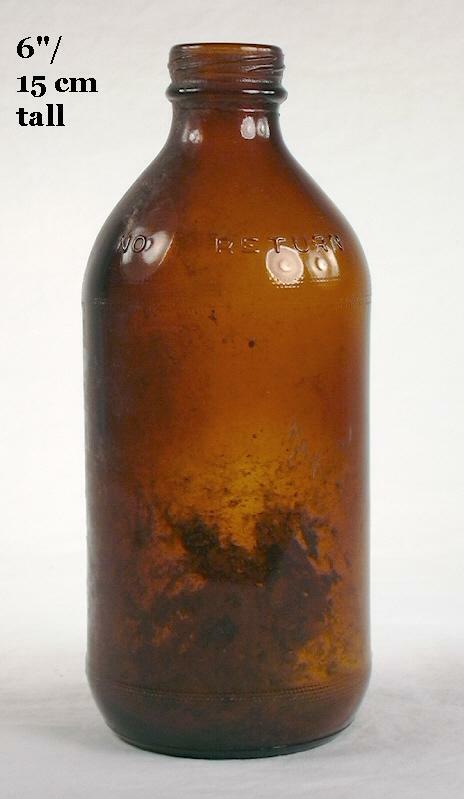 Early (pre-1870s) dedicated beer bottles (i.e., made specifically for beer) were very similar or identical to bottles used for soda and mineral waters and unmarked (not embossed or labeled) examples of these bottles can not be differentiated as to what product they originally held. With the prevalence of bottle re-use common, the same bottle could easily have held both products during its useable lifetime. The bottle pictured to the right is an example of a style commonly used for both beer and soda/mineral water during the 1840s on into the 1870s (this bottle dates from the mid-1850s and is discussed later). In the early 1870s, the process of pasteurization was applied to beer bottling allowing the increasingly popular lighter (in color and body) lager beers to be bottled and transported long distances without spoilage - something impossible before that time (Wilson 1981). Pasteurization in hand with the invention of improved closures like the Lightning stopper and later the crown cap (which both replaced the less reliable wired down cork), more accommodating laws related to brewing, improved transportation systems, and a growing taste of Americans for lager beers, allowed bottled beer to become big business throughout the country. Nationally distributed beers, led by the innovative Anheuser-Busch Company, began to make their way across the country by 1872 or 1873 (Anderson 1973; Wilson 1981). The ability to pasteurize and ship beer long distances diminished the importance of local breweries with its reliance on kegs and draught beer. This was so innovative that the Anheuser-Busch beer bottles shipped to the West proudly proclaimed on their labels that their beer would "Keep In Any Climate." 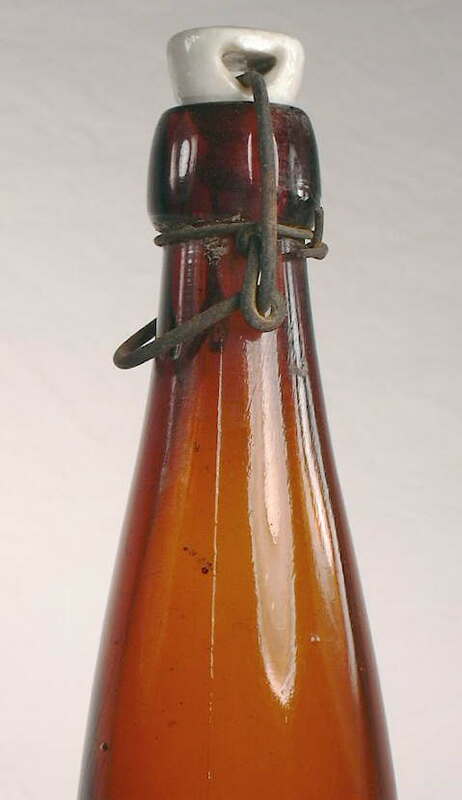 Click on Anheuser-Busch fragmental label to see an 1880s "export beer" example from historic Fort Bowie (Arizona) that shows this wording on the label (bottle from the National Park Service's WACC Ft. Bowie collection, Tucson, AZ.). During these early days of bottled lager beer only a couple primary bottle styles came to dominate the beer bottle market, most notably the distinctive "export beer" style (picture to the left above) and to a lesser degree the "champagne" or "lager" style (pictured below left under the stoneware bottle). The advent and widespread use of bottle making machines in the first couple decades of the 20th century, and the related move towards shape standardization, further narrowed the dominant styles for most bottle styles including those intended for beer. 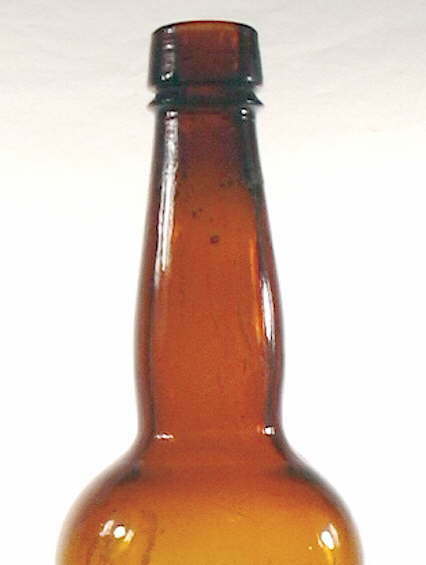 The export style is still one of the most common beer bottle styles. 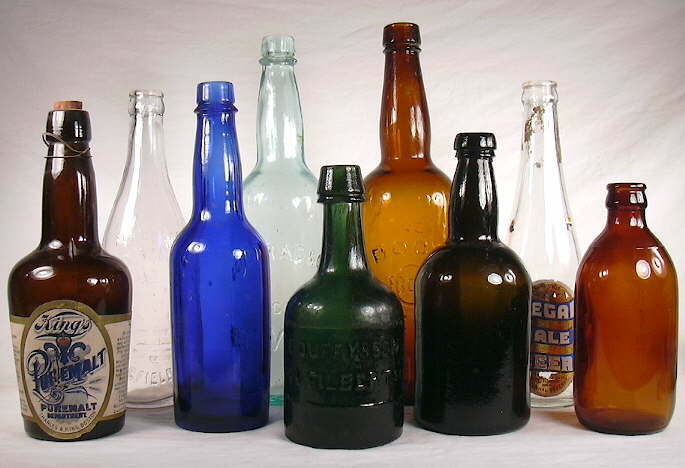 Note: Throughout the 18th, 19th, and early 20th centuries beer, as well as many non-alcoholic beverages, was commonly bottled in stoneware bottles like those shown to the left. Stoneware bottles did provide the ultimate in protection from the detrimental effects of light though had other problems that eventually lessened their popularity, e.g., weight (heavy) and closure limitations. The two-tone stoneware bottle pictured to the far left was made in Great Britain during the 1870s or 1880s. Many stoneware bottles found in the U.S. were imported from Great Britain and are a very common item on 19th century historic sites (Switzer 1974; Wilson 1981). This bottle also had a fragmental label noting that it contained either ale or stout (i.e., "Ale/Stout"). The medium brown stoneware bottle to the immediate left is almost certainly American made (incised with J. L. SCHRIBER on the shoulder) and is fairly typical of a U. S. made item from the 1850 to 1890 era (Peters 1996). (Photo from eBay®.) Stoneware or ceramic bottles for beer were generally discontinued in the U. S. after about 1895 (Graci 1995). However, the subject of stoneware or ceramic bottles is beyond the scope of this website and the subject is not covered further. As noted on the Spirits/Liquor bottle typing page, the growing strength of the Temperance movement and rising anti-alcohol fervor during the late 19th and early 20th centuries led to the passage of ever increasing restrictions on the manufacture and sale of alcoholic beverages including beer. The power of the Temperance movement culminated in the addition of the 18th Amendment to the Constitution on January 16th, 1919; the amendment written to take effect one year after ratification, i.e., January 17th, 1920. National Prohibition was the death of many local breweries who could not make survive just producing near beer, malt syrup, or soda type products during that dry time. The number of brewery plants in operation plummeted from 1,345 in 1915 to just 31 who were able to resume production within 3 months of the Volstead act revisions allowing for 3.2% beer in April 1933, although full repeal (21st amendment which included spirits and wine) did not occur until December 1933 (Okrent 2010). There was already a trend towards a lesser number of breweries producing higher volumes beginning in the late 1800s; the peak of breweries in the U.S. was in 1873 with 4,131 nationwide (Anderson 1973; Friedrich & Bull 1976). The trend towards fewer and larger breweries amplified in the decades after Prohibition so that today most beer is produced by just a handful of companies, though the rise and popularity of "micro-breweries" over the past couple decades has somewhat reversed that trend. 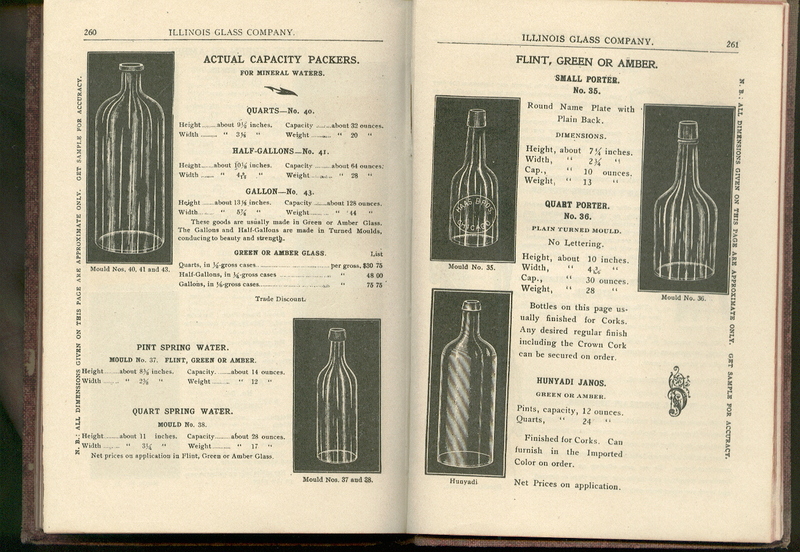 NOTE: Attached to the "Bottle Types/Diagnostic Shapes" grouping of pages is a complete copy of a never re-printed, 280 page, 1906 Illinois Glass Company bottle catalog scanned at two pages per JPEG file. Click 1906 IGCo. Catalog to access the page that links to all the scans of this very useful catalog. Beer bottles are listed primarily on pages 250-259. Each of the pictured bottles has a relatively short description and explanation including estimated dates or date ranges for that type bottle and links to other view pictures of the bottle. 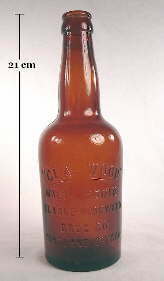 Additional links to images of similar bottles are also frequently included. During the first half of the 19th century, heavier ales were increasingly bottled and distributed in the eastern half of the U.S. though primarily within the immediate geographical region of the typically small breweries. Problems with spoilage confounded the long term storage and quality retention of beer making it a product that needed consumption fairly quickly after fermentation was complete. Prior to the Civil War most of the beer produced in the U.S. was of the Old World ale styles, including porter and stout. These beer types were relatively high in alcohol and more highly hopped than the later - though enormously popular - lager beer styles. The combination of alcohol and the natural antibacterial properties of hop oil allowed these beers to keep for some months without spoiling, though quality retention was still an issue as the flavor of beer deteriorates relatively rapidly as compared to wine and spirits (Wilson & Wilson 1968; Anderson 1973). 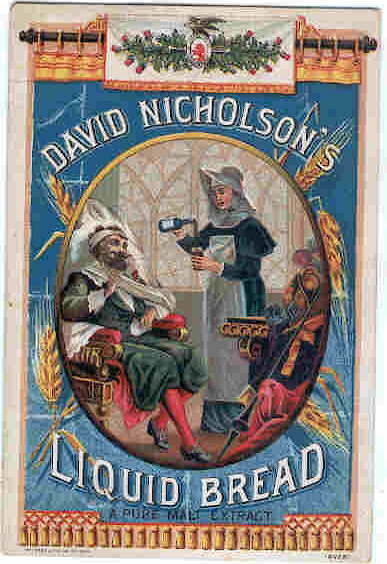 It is likely that much of the early production of bottled beer was for a heavy, high alcohol, non-carbonated product, i.e., it was "still" or "non-sparkling." This made the product easier to transport and less likely to lose carbonation due to inadequate sealing - a common occurrence since corks were unreliable for pressurized products - since there was no carbonation to loose (Plavchan 1969). There were various bottle styles used for beer during the first half of the 19th century, though the dominant theme seems to be short and squatty with a moderate length neck. This is indicated by the first three bottles pictured here, all of which represent styles that were most commonly used from or prior to the Civil War. 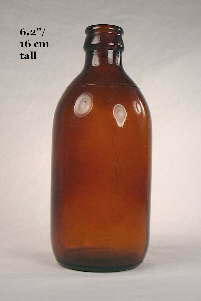 Another similar style that was used for ale/beer in the late 18th through the first half of the 19th century is represented by the bottle pictured at the following link - New England Glass Bottle Company spirits or ale bottle - which is discussed in the "squat spirits/utility cylinder bottle" section of the Bottle Typing/Diagnostic Shapes: Liquor/Spirits Bottles page. 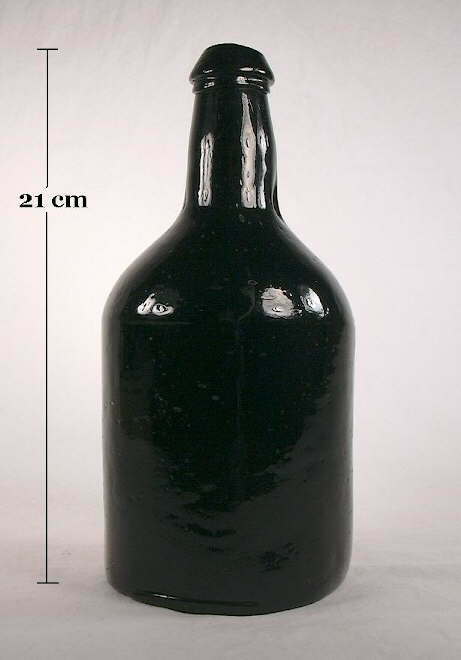 The earliest 19th century style of bottles were like the black glass bottle pictured above left and the deep aqua bottle pictured to the right. The black glass bottle above is a dip molded ale (or possibly liquor) bottle with a glass-tipped pontil scar that most likely dates from the 1850s as it was excavated from the Gold Rush country of California. 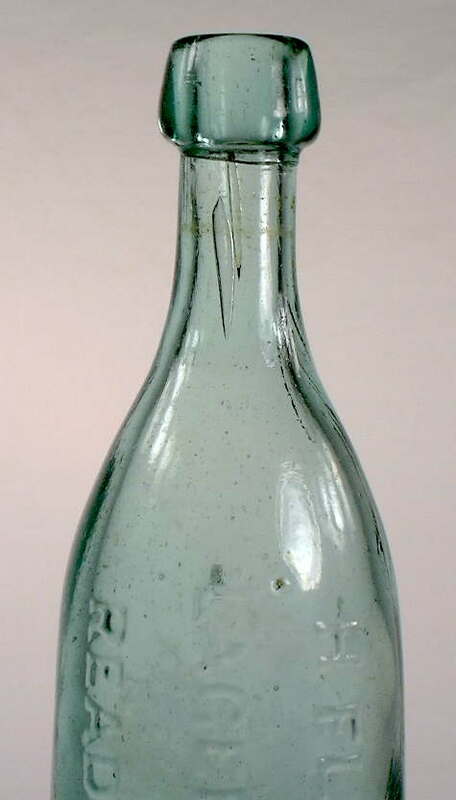 This is a very commonly encountered style bottle on historic sites dating from the 1820s to about 1870. Click on the following links to see more views of this bottle: base view showing the glass-tipped pontil scar; close-up view of the shoulder and lower neck showing the dip-mold line at the shoulder. These early black glass ale and porter bottles were referred to as "junk bottles" from at least the late 18th century through mid 19th century (McKearin & Wilson 1978). 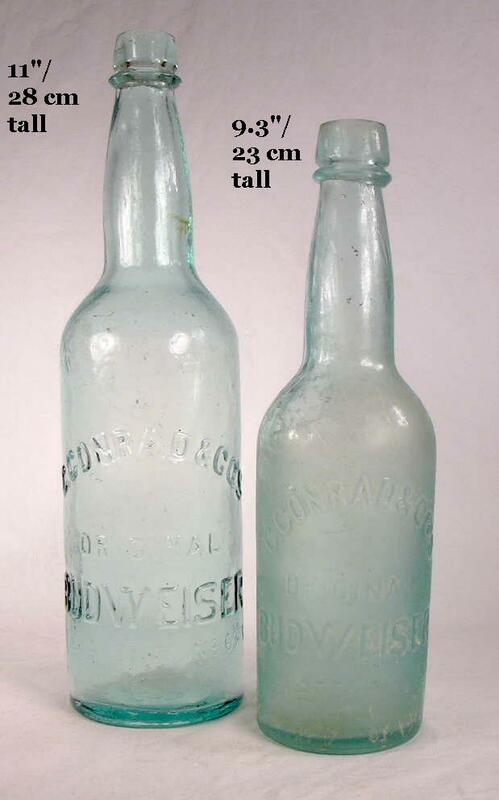 The bottle to the right is likely an early American (1840s) ale or mineral water bottle (picture from eBay® listing). This interesting bottle is free blown with a iron or improved pontil scarred base and has an early style of finish that is called an "inverted taper" or "tapered down" finish (Jones & Sullivan 1989; Mechow 2005, pers. comm. 2011). 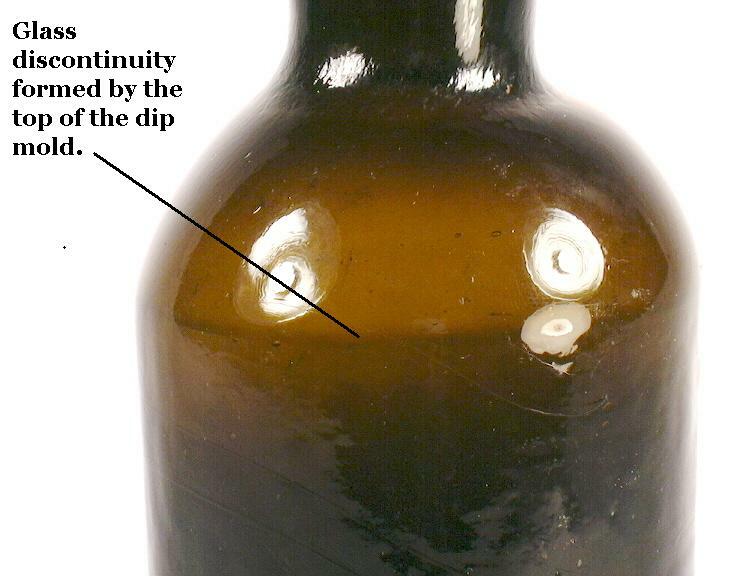 This finish is covered briefly on the Bottle Finishes & Closures: Part II - Types or Styles of Finishes page as a separate finish type as it has been observed with some frequency on bottles attributed to the glassworks in the Pittsburgh, PA. area (von Mechow 2005). Of course, without some type of positive identification (label and/or embossing) there is no sure way to determine to what use this bottle was actually put and it could have been used for spirits, medicines, or many other liquid products although these types were also also used for products that diverged greatly from the usual liquid contents including use for caraway seeds and ground pepper (McDougall 1990). The true green bottles pictured to the left and right are very typical short, squat, mid-19th century beer (ale, porter, stout) bottles with fairly abrupt shoulders and comparatively tall, straight (non-bulging) necks. Mineral finishes are most commonly seen on this style, though occasionally other finishes are present like the blob or oil finish. This distinct shape was and is often referred to as a "porter" or "porter bottle" (von Mechow pers. comm. 2011) and was undoubtedly used very frequently for that early type of beer (and occasionally mineral water); bottles noting that they contained "Porter" or "Ale" via the embossing are frequently seen. The early example pictured to the left is embossed on one side - in a very distinct plate - with E. DUFFY & SON / 44 FILBERT St. The other side is embossed (not in a plate) with DYOTTVILLE GLASS WORKS (arched) / PHILAD.A (Philadelphia, PA.). This particular bottle has a crudely applied mineral finish, a distinct iron or improved pontil scar or mark on the base, no evidence of air venting, and an overall crudity befitting its manufacturing date of about 1854 to 1856. These earlier Dyottville bottles also come in slightly taller style (~3/8" taller in the body) but are otherwise the same conformation (von Mechow 2006). 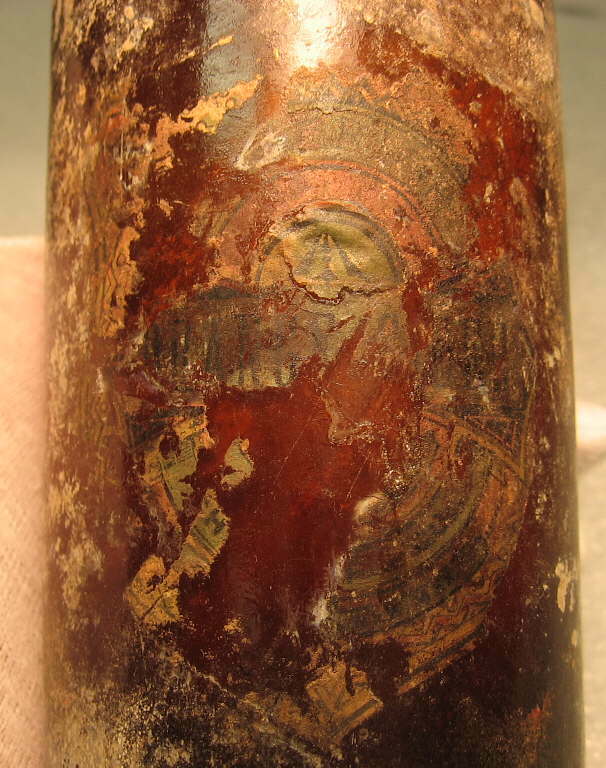 Click on the following links to view more images of this bottle: base view showing the large and distinct iron pontil scar; close-up of the plate embossing; close-up of the reverse side showing the Dyottville embossing; close-up of the shoulder, neck, and finish. Other Eastern American glass companies also produced porter bottles, though Dyottville was a prolific producer (McKearin & Wilson 1978). The more generic porter bottle pictured to the right is an example of the somewhat later (1865-1875) style variation being narrower in diameter (2.75" versus 3") than the earlier versions like pictured to the left, but otherwise very similar in overall conformation. It is embossed on one side (not in a plate) with DYOTTVILLE GLASS WORKS (arched) / PHILAD.A, has an applied mineral finish, and is not pontil scarred which is typical of the later (post mid 1860s) porters. This was a generic bottle produced by this prolific glassworks for those who wished to label their product or did not want to bear the extra cost of proprietary embossing, (next paragraph). Click base view an image of this bottles base. 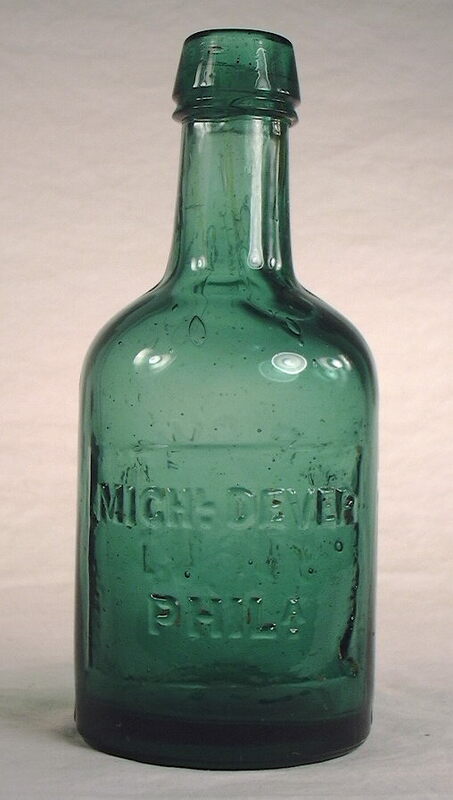 The color of both these bottles is very typical of the porter and mineral water bottles made at the Dyottville Glass Works during the mid-19th century and has been dubbed "Dyottville Green" by collectors. Bottles with the "porter" shape were very commonly used for beer (and sometimes mineral water) bottling east of the Mississippi during the period from the mid-1840s through the 1870s (McKearin & Wilson 1978). This style was offered frequently as a plate mold and proprietary embossing is very common on these bottle types during the era of popularity. 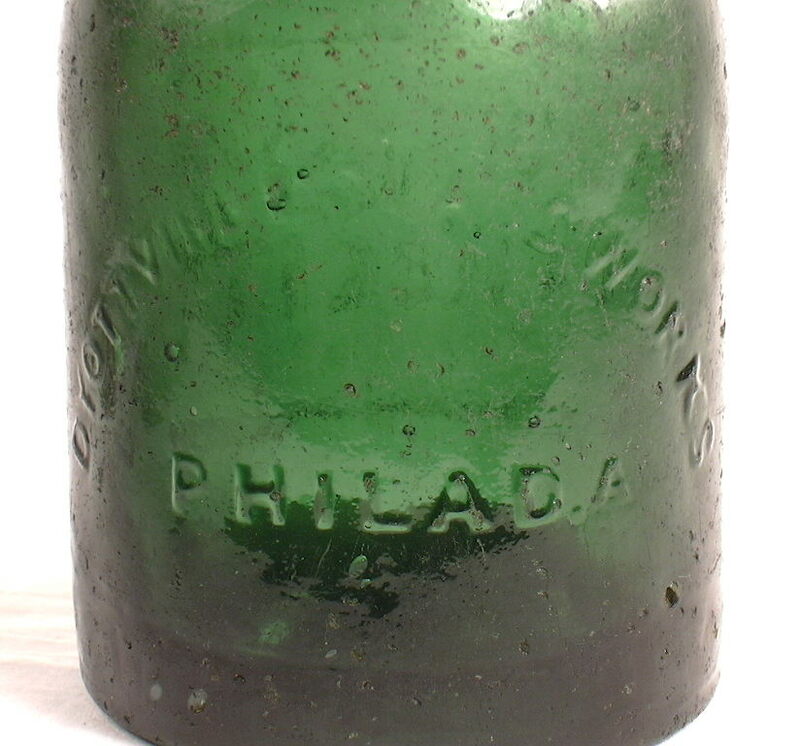 Big eastern seaboard cities like New York and Philadelphia had scores if not hundreds of different proprietary embossed examples made for local bottlers; generic bottles are also quite common (von Mechow 2006). Judging from embossed specimens, this shape was rarely used west of the Mississippi with a few notable exceptions in Colorado, Kansas, Iowa, and likely a few other states, and little used as far west as the Pacific states where no locally embossed examples are known (Preble 1987; Fletcher 1994; Markota 1994; Burggraaf & Southard 1998). Although the era of popularity for this general style for beer/porter seems to have ended about 1880, it was used somewhat until the early 20th century, though use that late was uncommon (Illinois Glass Company 1903, 1911; von Mechow 2006). Click I.G.Co. 1906 catalog - pages 260-261 to see the 1906 catalog offering of a "small porter" bottle that appears to have a brandy or straight brandy finish but is otherwise similar to the later Dyottville bottle discussed above - including the same diameter body. Lager beer was first noted as being produced in Philadelphia, PA. in the 1840s but did not really explode in popularity until the Civil War era when lager surpassed all the other beer types combined in production. With the application of pasteurization to beer bottling in the early in 1872 to 1873 the popularity of lager style beers increased dramatically and beer could be shipped all over the country with much less of spoilage and souring (Wilson & Wilson 1968; Wilson 1981). The lighter, crisper flavor of lagers appealed to a wide cross section of the population where climates were warmer and lighter beers more refreshing (though pre-Prohibition lagers were of higher body than most modern examples). This leads into the next sections which cover bottles primarily intended for lager beers, though these other bottle styles were likely used for porter, ale, and stout which did not disappear with the rise of lager popularity (though almost did with National Prohibition). BROWN / STOUT - MICHL DEVER / PHILA - This is another example of an early ale or porter type bottle, though this one notes it contained "brown stout" which is a type of ale popular during the mid-19th century and before (and in more modern times with the renaissance of micro-breweries). Both body sides are illustrated to the right having the embossing noted above with only the Dever side being in a very distinct plate. Undoubtedly this same mold was use for making "brown stout" bottles for many customers by replacing the plate with another differently engraved one. 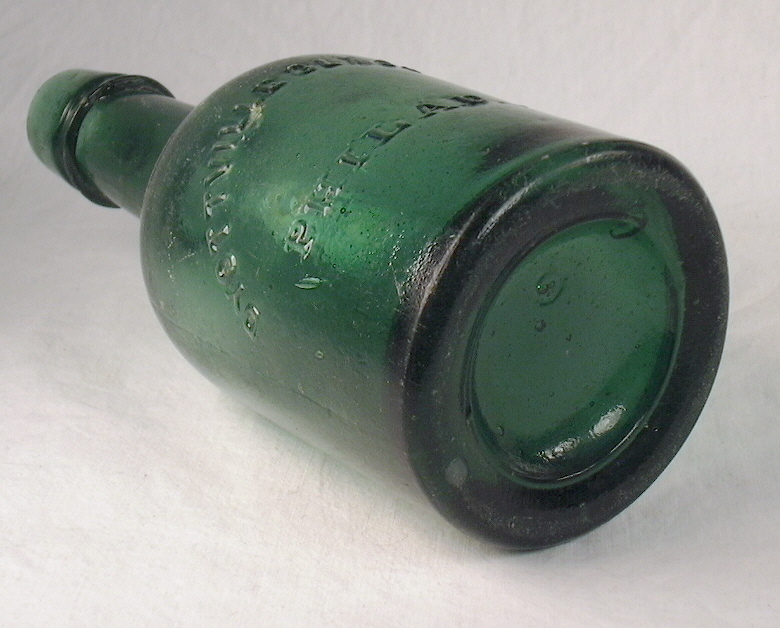 This brilliant green (a common color for these bottles during this era) example is 6.5" tall and 2.75" in diameter, has a crudely applied mineral finish, no evidence of mold air venting, and was blown in a true two piece mold - a somewhat unusual conformation for this style bottle, though common to the era, this bottle dating from the late 1850s to mid-1860s. Click on the following links to see more images of this bottle: base view showing the distinct mold line dissecting the base and indicating production in a true two-piece mold; close-up of the shoulder, neck, and finish. 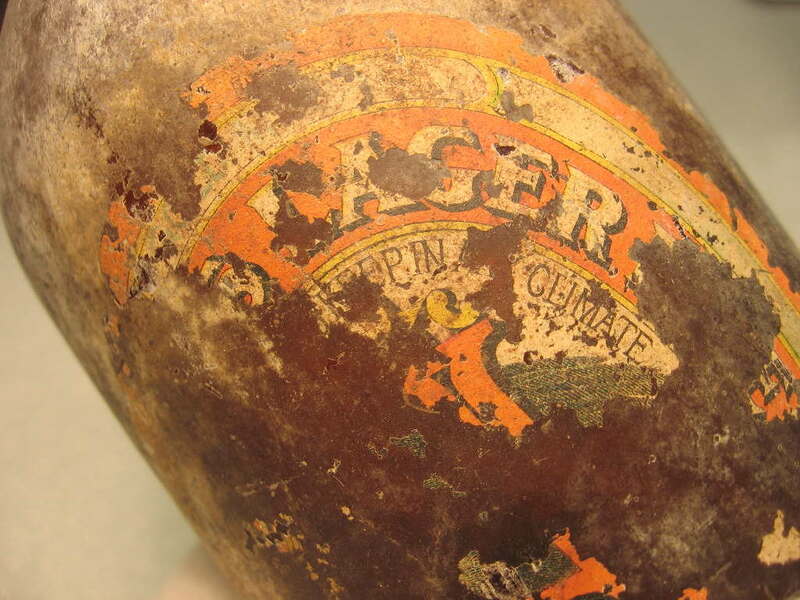 Dating Summary/Notes: The early porter, stout, and ale bottles with the shapes noted above typically date from the 1870s or earlier. During and after the 1870s, these general styles faded from popularity as the other styles covered below rose in popularity. The squatty style for beer never totally died out with some English beer bottles still bearing a resemblance to the style (empirical observations). The squatty "porter" shape - as some glassmakers called it - was actually still being produced as late as 1911 (IGCo. 1911). Click IGCo. 1906 catalog - pages 260-261 to see the offering in the 1906 Illinois Glass Company catalog which still produced this style with plate mold capability (page on the right). Given this wide range of manufacture, the dating of the "porter" style bottles (and the stout styles also) must be based on manufacturing based diagnostic features as discussed on other pages within this website. The "export" style of beer bottle (picture to left) has a long history dating back to at least the early to mid 1870s in the forms shown here, with precursor examples dating back long before that time. This general style of beer bottle is still widely used today for lager beers, though they are also used by modern "microbreweries" for almost any style of beer, e.g., porter, ales, stout, weiss (wheat beer). The name "export" apparently is derived from the major exporting business conducted by the St. Louis breweries after the pasteurization process was applied to beer bottling in the early 1870s. Much of this production was shipped - "exported" - to the Western states and Territories (Year Book 1882). Of interest, export beer bottles were often used (or more likely re-used) for soda, cider and sarsaparilla, at least in the frontier West where bottles of any type were likely in short supply during much of the 19th century. Click on orange cider "export beer" label to see the fragmental label on a "quart" export beer - similar to the bottle to the left - found at the historic Fort Bowie (Arizona) that dates from the 1880s. It notes that the product last contained in the bottle was orange cider. (Pictured bottle in the National Park Service's Ft. Bowie collection, WACC, Tucson, AZ.) All of the partially labeled export beer bottles with soda, sarsaparilla, or cider labels found at Fort Bowie were from an unknown Lordsburg, NM. bottling company (Herskovitz 1978). 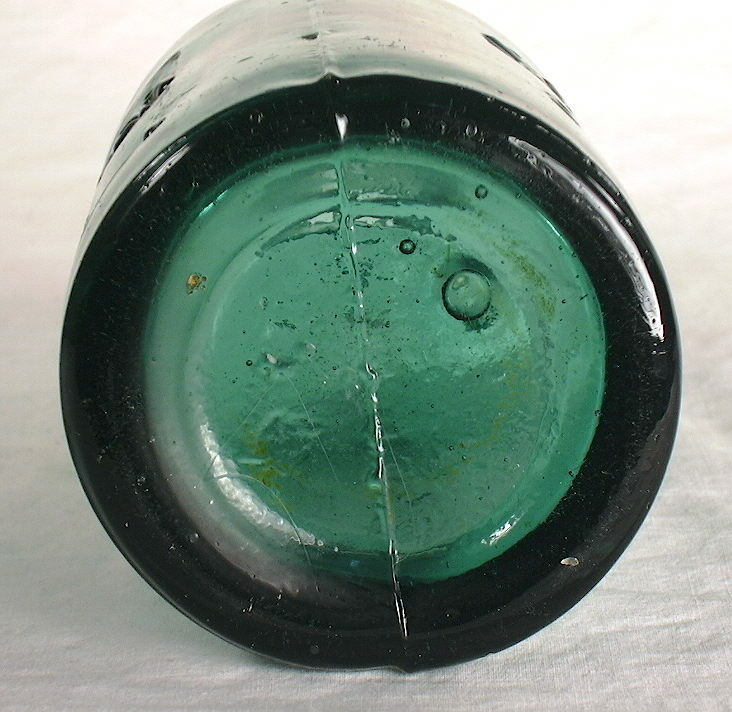 The export style appears to be an evolutionary development from the tall, relatively slender black glass ale/spirits type bottles, like the last bottle pictured in the section above and that pictured at this link: tall dip mold cylinder (this bottle is discussed on the "Liquor/Spirits Bottle" typing page in the "Cylinders" section). Both bottles are only slightly different than the typical late 19th/early 20th century export beer bottle pictured to the left with the exception of color; export style beer bottles are infrequently (though of course occasionally) seen in black glass or shades of true green. Other names for this style are few as the majority of glass makers used the term "export beer" to describe this shape (IGCo. 1903, 1911, 1920; Bellaire Glass Co. ca. 1905; Cumberland 1911; Obear-Nester 1922; Fairmount 1930s). 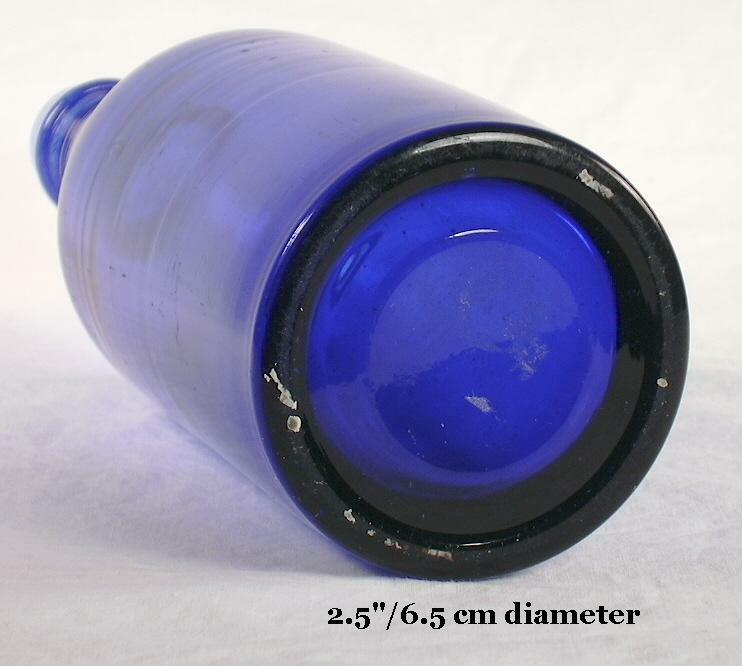 However, some glass makers called the style the "bulb-neck beer" and others simply called it the "beer bottle shape" (Swindell 1902; Alther 1909; Wilson & Wilson 1968). The export style of beer bottle has a body length that is usually equal to or a bit taller than the height of the shoulder, neck, and finish combined. They usually also have a somewhat distinct though variable bulge to the neck and a relatively slim to moderate diameter body. The bulging neck is thought by some to be a way to deal with the foam (when pouring or bottling?) though that is a highly debatable point. More likely the bulging neck is simply just a stylistic feature that was esthetic, popular, and traditional, as shown by the noted precursor bottles. The shoulder of the export style is distinct but short and fairly sharply angled in from the shoulder to where the neck begins; see the export bottle pictures here and compare to the "champagne" style that follows. The export shape is strongly linked to lager beers which were first bottled around 1872-73 (Wilson 1981). 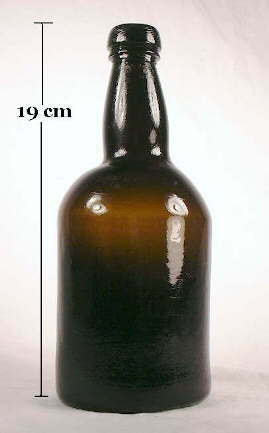 Early bottle makers catalogs listed export beer bottles in a limited range of sizes, though often with several sizes within the sizes available. Confusing? 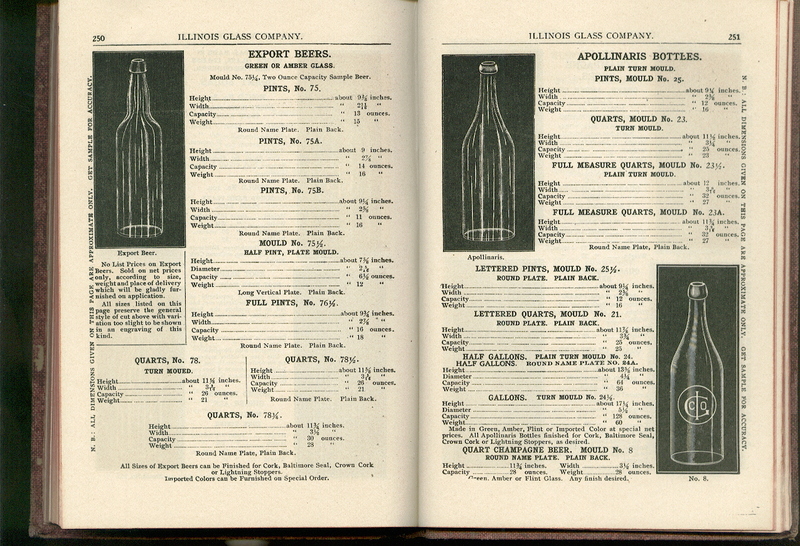 For example, the Illinois Glass Company's 1906 bottle catalog includes 4 different "pint" export beers (11, 13, 14 and 16 oz.) and three different "quart" bottles (two molds that held 26 ozs. and one that held 30 ozs.). Click IGCo. 1906 catalog - pages 250-251 to see the actual catalog page (IGCo. 1906). 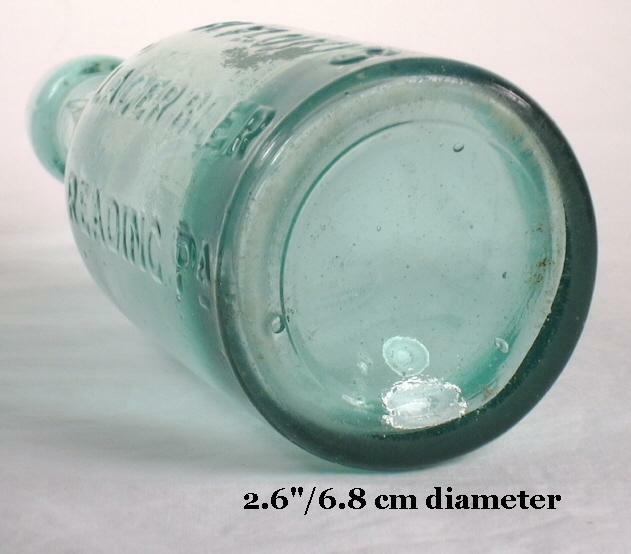 Bottle makers would often call the smaller capacity bottles - smaller than the nominal name size - "scant" capacities and the full size the "full measure" version; both very descriptive (Wightman ca. 1900). The finishes on export beers include the typical types used on carbonated beverages. Earlier (mid 1870s to early 1890s) examples usually had some type of a two-part mineral finish (like the bottle to the right) with various forms of the blob finishes also common from the early 1880s to mid 1910s (picture above). 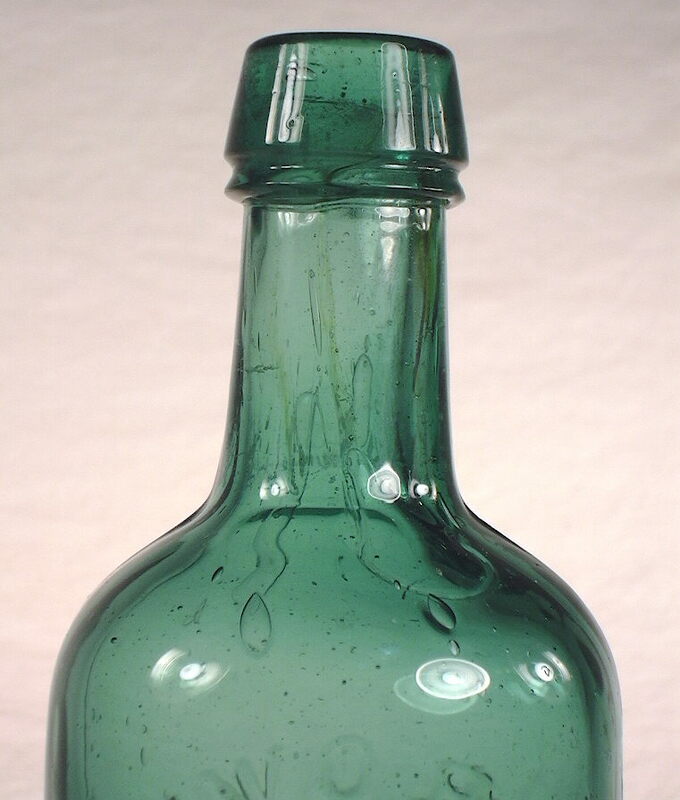 An aqua colored quart export style bottle with a blob finish dating between 1908-1911 is at this link - Honolulu Brewing Company. This is the company that originated "Primo Beer" and were in business under the name Honolulu Brewing Co. from 1898 to 1920 (Bull, et. al. 1984; Elliot & Gould 1988). After the late 1890s, crown finishes began to become popular and by the early to mid 1910s dominated beer (and soda) bottles. A crown finish is pictured on the labeled bottle in lower left corner of this box. Crown finishes are still common on export style bottles today, though the finishes/closures are more often external screw threads with a type of crown cap that screws off instead of needing a bottle opener to remove. 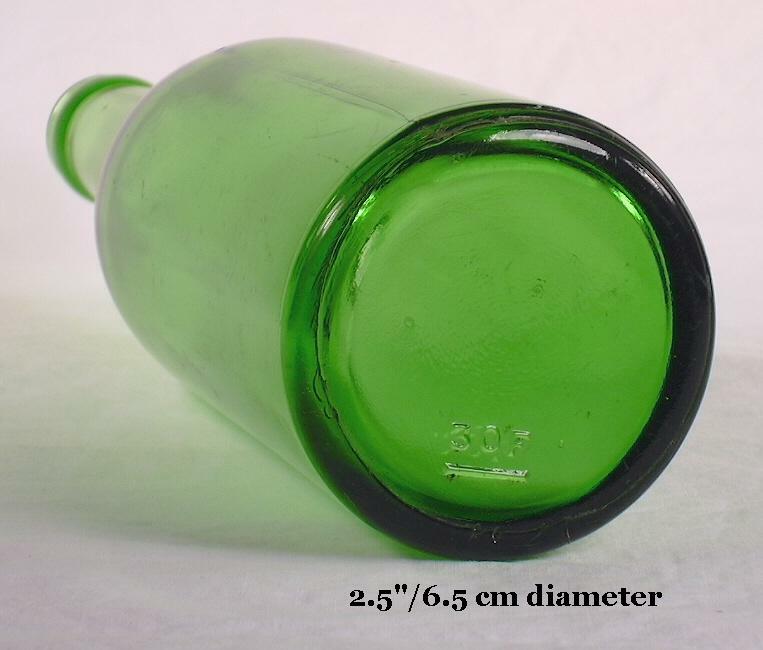 Pictured to the left is a mid-20th century export beer bottle which, except for the narrow ring on the lower neck, is visually indistinguishable from beer bottles that were produced during the early 20th century or those still being produced today. 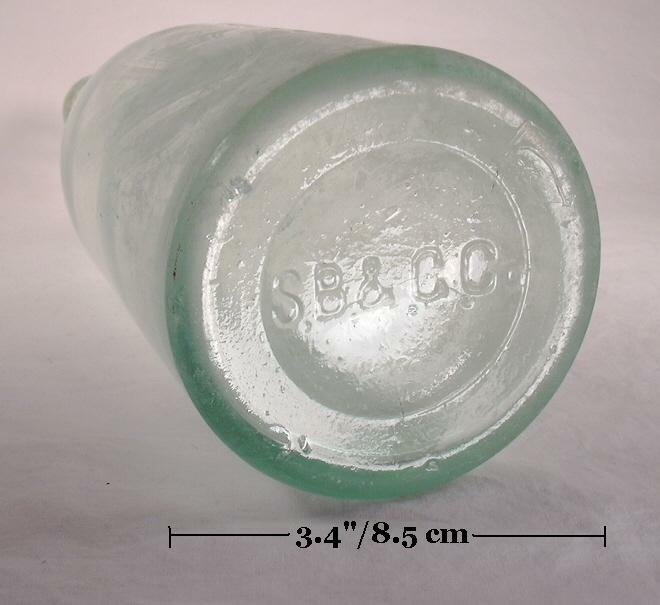 This particular bottle was produced by the Owens-Illinois Glass Company (Oakland, CA. plant) in 1941 - as determined by the date and glass company codes on the base - then used by the Columbia Brewing Inc. (Tacoma, WA.). This company did business under that name from 1934 to 1953 when it became the Heidelberg Brewing Co. (Van Wieren 1995). Owens-Illinois and many other companies produced (and still do) export style beer bottles in primarily the 12 oz. and 22 oz. sizes. One major difference between recent and early to mid-20th century export beers is the weight of the glass. A currently produced 12 oz. 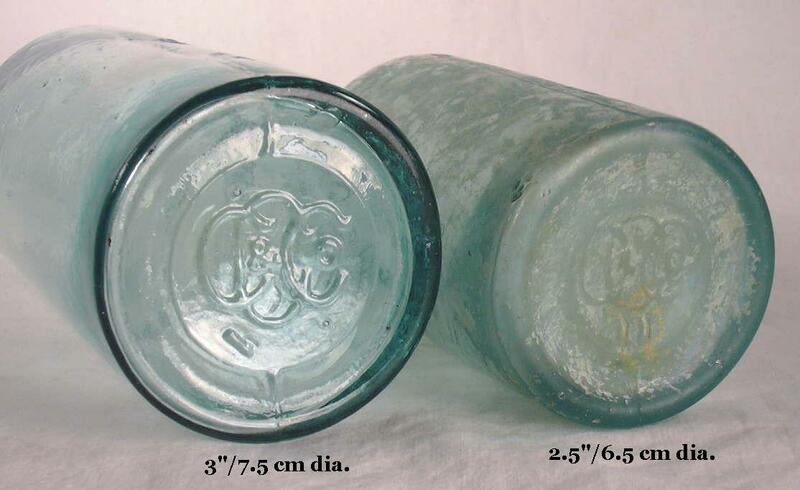 capacity example made by the Owens-Illinois Glass Company weighs about 8 ounces empty, whereas the pictured 11 oz. capacity, 1941 example made by the same company weighs about 12 ozs. - about 50% heavier glass. Some pre-WWII machine-made examples can weigh in the 13-14+ oz. range. The WWII era examples were made a bit lighter because of war effort related government restrictions, but became even lighter after that time for other reasons, e.g., improvements in glass quality, efficiency, etc. 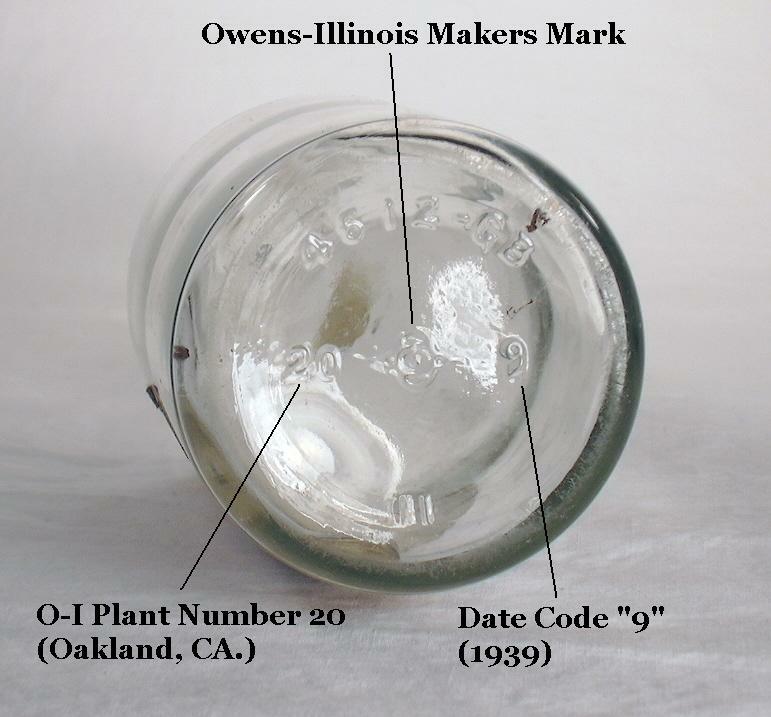 Click on the following links to view more images of the bottle to the right: base view showing the makers markings with the "20" being the plant code (for the Oakland, CA. plant which began operation in 1936 and still operates today) and the "1" being the year date for 1941; close-up of the shoulder, neck, and finish (Toulouse 1971; Lockhart 2004d). The base is also embossed with Duraglas which was used by the company from 1940 to possibly as late as 1963 (Toulouse 1971; Miller & Morin 2004). See the machine-made bottle dating page Question #11 for much more information on the dating of this particular bottle. This style of export beer with a narrow lower ring neck was commonly produced from just after the repeal of National Prohibition in 1933 to the early 1950s by numerous glass producers (empirical observations). Dating Summary/Notes: As noted, the export style of beer bottle was made for an very long time, i.e., from at least the mid 1870s continuously up to the present day - an amazing length of time. Mouth blown examples were produced in both turn molds and two-piece molds with either a cup-bottom or post-bottom configuration. During the mouth-blown era (1870s to mid-1910s) the export style was much more popular in the West than the champagne style (Martin 1973; Ayres et. al. 1980; Lockhart & Olszewski 1994). The only real changes have been the method of manufacture (mouth-blown to machine-made) and the use of modern finishes/closures in the 20th century (crown cap and screw threads). Given this, the general dating of the export style bottle must be done using manufacturing based diagnostic features - see the Bottle Dating pages for more dating information - or by searching the historical record when the company or product related embossing or labeling allows for such like some of the examples pictured here. One note on beer bottle finishes is that these were some of the last bottle types to be more or less fully converted from true applied finishes to tooled finishes; many beer bottles from the early 1890s were made with applied finishes and tooled finishes were probably not ubiquitous until the mid 1890s. By far the best source of information on the origin and history of the export style beer bottle is found in a recently (2007) published article by Bill Lockhart. Like the export style beer bottle discussed above, the "champagne" style of beer bottle also has a long history including use up to the present day. The name and shape of the champagne beer bottle style indicates its evolutionary heritage from the wine/champagne bottles of essentially the same shape and proportions. The champagne style appears to have been first used for bottling beer about the same time as the export style, i.e., the early to mid 1870s. 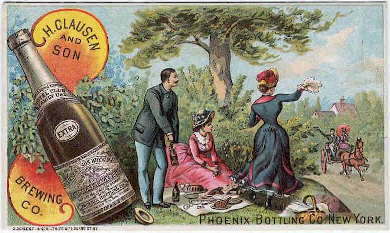 However, regular olive green champagne bottles were used for beer bottling prior to that time as well as later, as indicated by the trade card pictured below right which dates from around 1890 (McKearin & Wilson 1978; Wilson 1981). For more information on the history of this shape, see the champagne bottle section of the Bottle Typing/Diagnostic Shapes : Wine & Champagne Bottles page. This basic style was also called the "lager" or "select" beer style by some glass makers. 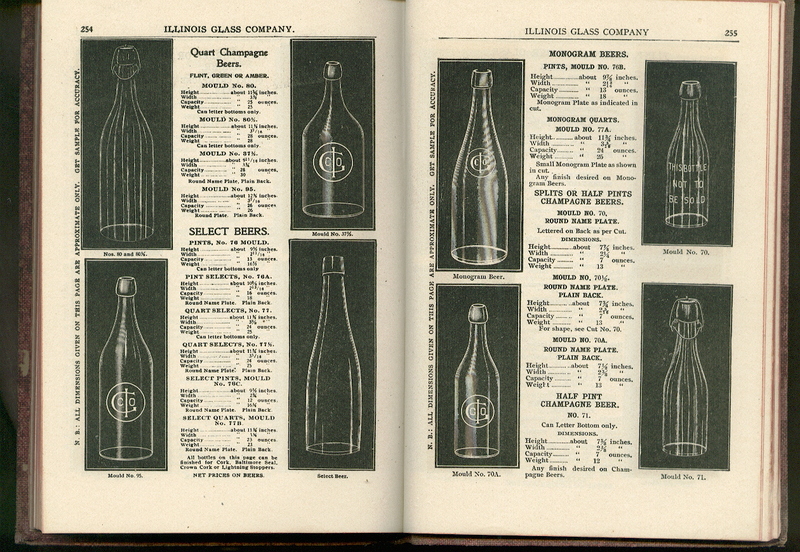 The early 20th century Illinois Glass Company catalogs note that company made both the champagne and select beer bottle styles, though in the illustrations it is difficult to see any substantive difference between the two with the exception that the transition between the shoulder and neck is less distinct with the select style. Click on IGCo. 1906 catalog - pages 254-255 to view two pages that show illustrations of both styles and the subtle difference between the two. The three bottles pictured last in this section all pretty closely fit the illustration of the "select" style. A comparison of those three bottles with the first two pictured on the left side of this section does show the less distinct shoulder to neck transition which is subtle. By the 1920s many companies were calling the champagne style the "select" though it was indistinguishable in the illustrations from the earlier champagne style beers (IGCo. 1906, 1920; Obear-Nester 1922). A very similar bottle to the champagne style is the Apollinaris style bottle which was used primarily for mineral water, but certainly saw duty as a beer bottle too. In at least one early 1930s catalog, the Apollinaris style is listed right next to the export beer indicating that it was offered as an alternative to the export style (Fairmount 1930s). On this website we refer to this class of beer bottles usually as simply the champagne style. The champagne style beer bottle has a moderate height body with almost vertically parallel sides and a long, steep, sloping shoulder which starts gradually and merges seamlessly into the neck. The height of the shoulder and neck in combination is usually equal to or a bit more than the height of the body, though the break between body, shoulder, and neck is often not obvious in some examples. Unlike most "true" champagne bottles, champagne beer bottles do not have a deeply indented base (push-up) and are not typically found with a champagne finishes, though that finish does occur occasionally on beer bottles. Almost all of the earlier (pre-1895 to 1900) mouth-blown champagne beers have variable blob finishes, like the first three bottles pictured here, with occasional crown finishes by the mid to late 1890s. A crown finish is pictured on the bright green bottle in lower left corner of this box. Unlike the export style, mineral finishes are very unusual on the champagne style even in the earliest days (Blumenstein 1963 & 1965; Sellari 1969-1972; Lincoln 1970; Martin 1973; Anderson 1973; Feldhaus 1986; & others). By the very early 1900s crown finishes became increasingly popular so that by the mid-1910s that finish/closure dominated beer (and soda) bottles. Crown finishes are still seen on these style bottles today, though modern finishes/closures are more often external screw threads with a type of crown cap that screws off by hand (if one has a strong grip). The amber, "quart" (approx. 25 ozs. 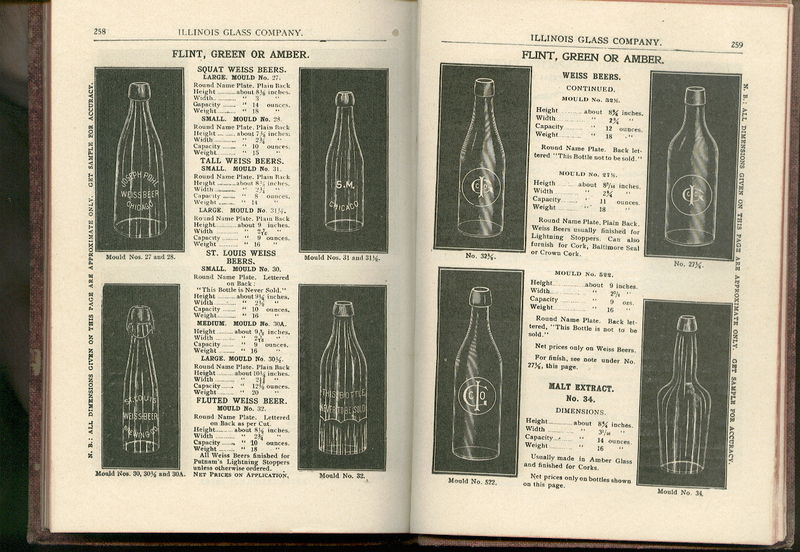 ), champagne style beer bottle pictured to the above left is embossed with UNION BREWING / AND / MALTING COMPANY / S.F. CAL. It is also embossed on the base with P. C. G. W. which indicates manufacture by the Pacific Coast Glass Works (San Francisco, CA.) which used this mark from 1902 to about 1924 (Toulouse 1971). The Union Brewing & Malting Company operated under this name from 1902 to 1916 (Bull et. al. 1984). 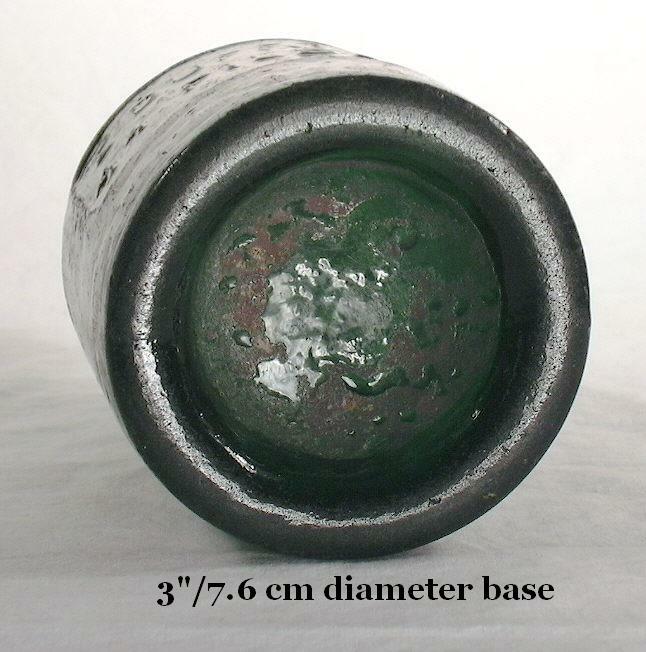 This example has a tooled blob finish, multiple shoulder air venting marks on each side, and was blown in a post-bottom mold which was particularly common with beer bottles into the early 20th century and likely dates from between 1902 and 1912. This bottle likely was sealed with a Lightning type bail stopper. 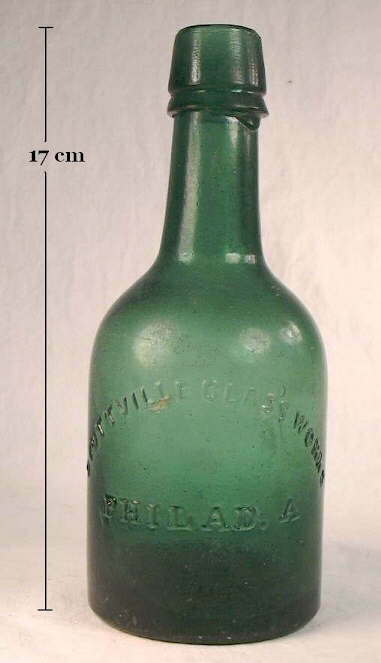 Click on the following links to see more images of this bottle: base view showing the PCGW mark faintly; close-up of the shoulder, neck, and finish. The aqua bottle pictured to the left is a small (9-10 oz.) champagne style beer bottle that is embossed H. WEINHARD / PORTLAND, OR. in a round plate. It is also embossed BOTTLE / NOT TO / BE SOLD on the reverse and S B & G Co. on the base. The latter indicates manufacture by the Streator Bottle & Glass Company (Streator, IL.) which was in business under this name from 1881 to 1905. This company was a large producer of beer bottles in the U.S. and was eventually merged with other companies to become the American Bottle Company in 1905 (Toulouse 1971). Henry Weinhard was one of the oldest brewers in the West, brewing beer (or during Prohibition other non-alcoholic products) from 1862 to 1928. At that time, probably as a result of the hardships of Prohibition, it became the Blitz-Weinhard Company (Bull et. al. 1984). 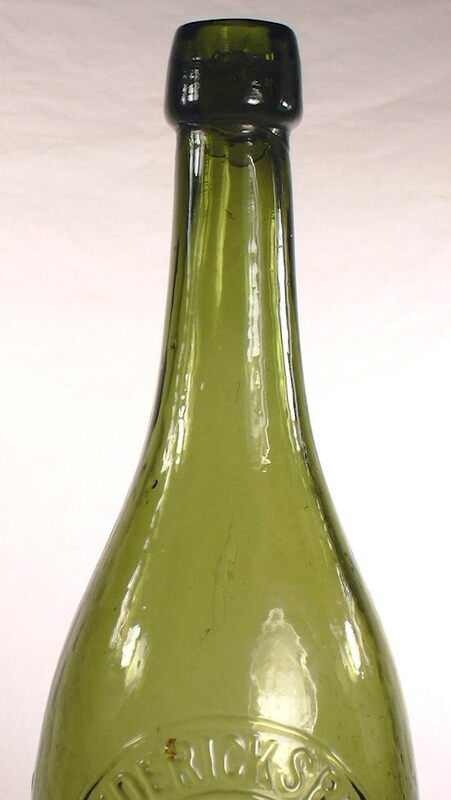 This particular bottle with a tooled blob finish, multiple (4) air venting marks on both shoulders, and produced in a cup base mold likely dates between 1895-1905. Click on the following links to view more pictures of this bottle: base view showing the makers mark; view of the reverse side of the bottle showing the embossing there; close-up view of the shoulder, neck, and finish. The "quart" (approx. 25 oz.) 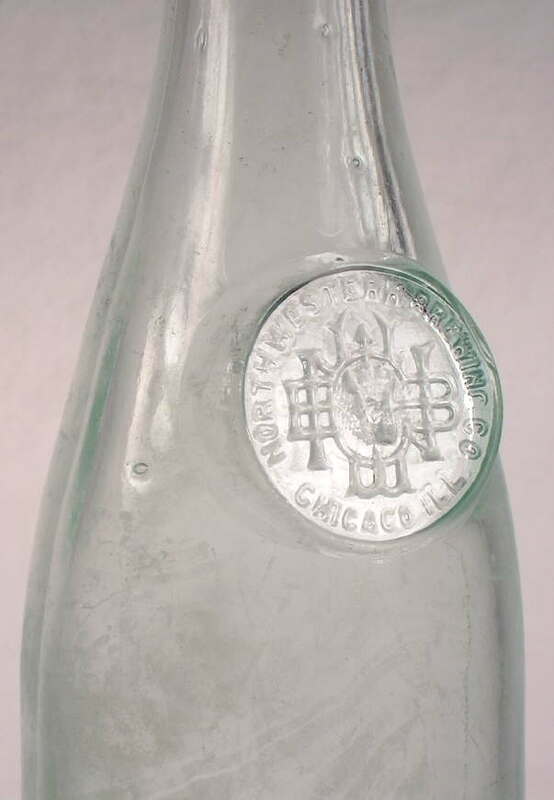 aqua champagne style beer bottle pictured to the right is embossed NORTH WESTERN BREWING CO. / CHICAGO, ILL. with a monogram that includes a buffalo head, inside of a raised circle (likely plate) on the shoulder. 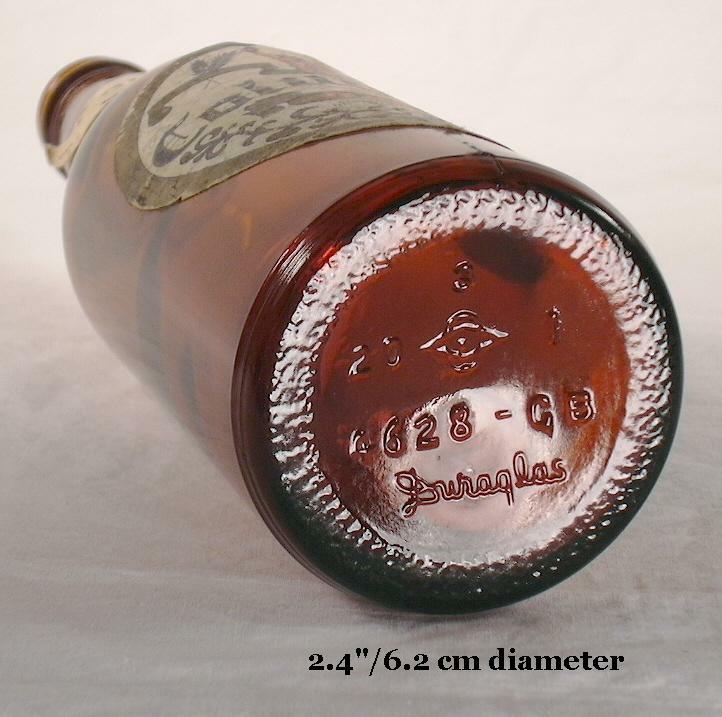 This bottles base is also embossed with S. B. & G. Co. indicating manufacture by the Streator Bottle & Glass Company (Streator, IL.). This beer bottle has a Baltimore loop seal closure accepting finish. Click Bottle Finishes & Closures, Part III: Types of Bottle Closures to move to the section of that page which covers this closure type. 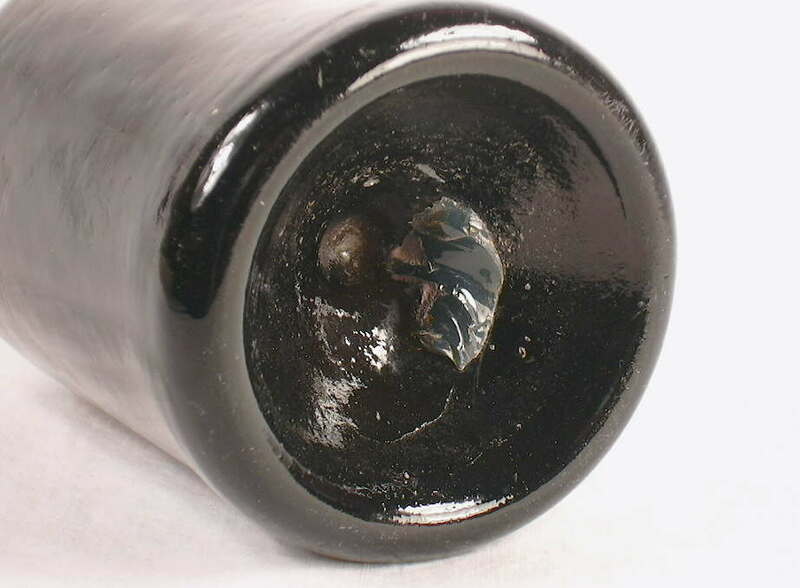 This bottle also has a tooled blob finish (with the distinctive Baltimore seal "groove" inside the bore), multiple air venting marks on the back shoulder, and was produced in a post-bottom mold. This company was in business with this name from 1888 to 1909 (Bull et al. 1984). The makers mark and company information in combination gives a pretty positive date range for this bottle of 1888 to 1905, entirely consistent with the manufacturing features noted. Click on the following links to view more images of this bottle: base view showing the makers mark; close-up view of the embossing and shoulder. Streator's cross-state rival the Illinois Glass Company (Alton, IL.) offered a very similar champagne style "Monogram Beer" in their early 20th century catalogs, though this shape of bottle also fits the "select" beer style definition noted earlier. Click IGCo. 1906 catalog - pages 254-255 to view an almost identical bottle which was offered with any finish (including the Baltimore seal) and as a plate mold like this Streator example. The bright green select or champagne style (this one could be called either way) bottle pictured to the left is a machine-made, 12 oz. size with a crown cap accepting finish made around 1930. The base has the embossing "30F" which is suspected to be a 1930 date code from some unknown glass factory (Lockhart pers. comm. 2005). The base also has a distinct suction scar that indicates production by the Owens Automatic Bottle Machine. Machine-made examples in this champagne style with a crown cap were typically used for beverages (beer and more so for soda) from the mid 1910s to 1950s. 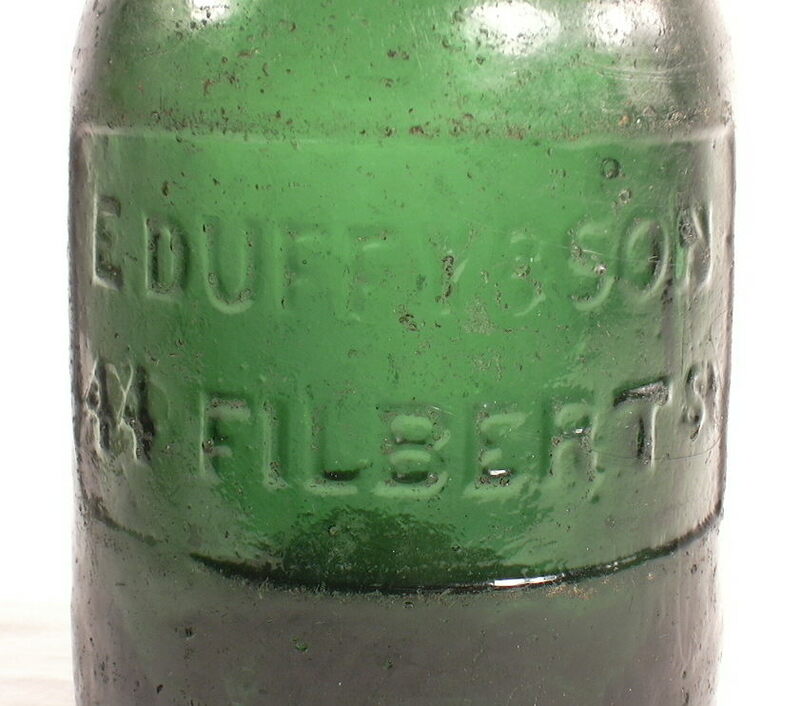 In this bright green color, the bottle was most likely used for soda; the author of this website has an identical example with CANADA DRY embossed on the neck and base. However, green was used frequently in Canada for beer (Unitt 1980a & b). Colors for this style range from colorless to shades of amber to greens - like that pictured - to even black glass. See the Soda & Mineral water bottle typing page for more information on this style used for soda. It appears that the amber and possibly some colorless examples were most often used for beer and the other colors (green, black glass, colorless) were primarily used for soda, though no doubt there was high interchangeability (empirical observations). Click on the following links to see more images of the bright green example to the left: base view showing the embossing; close-up of the shoulder, neck, and finish. The champagne style beer bottle pictured to the right is a "Regal Pale Beer" from the Regal Amber Brewing Company of San Francisco, CA. 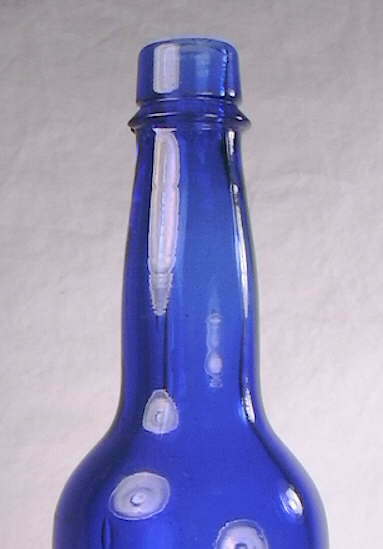 This bottle has markings on the base indicating it is a product of the Owens-Illinois Glass Co. being produced in 1939 by their Oakland, CA. plant. 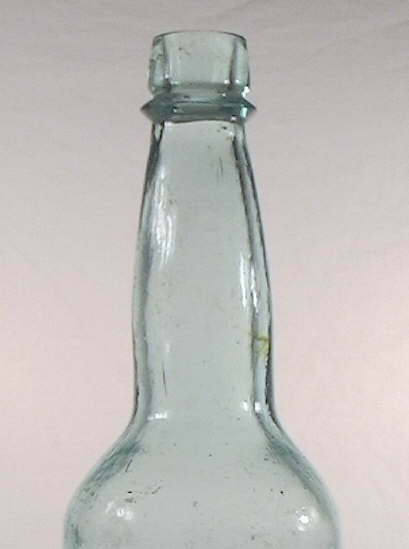 Click on the following link - base view - to view a picture of this bottles base with the pertinent makers markings pointed out which led to the above conclusion about this bottles manufacturing. 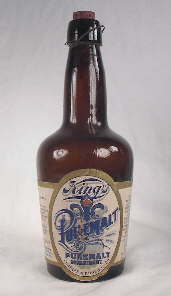 The Regal Amber Brewing Company operated under this name from 1935 to 1954 which is consistent with the dating found on the bottle itself (Bull et. al. 1984). This bottle also fits the subtle "select" variation description of the champagne style as the transition between the shoulder and neck is very indistinct. Liberty Brewing Co. - This mouth-blown colorless champagne or select style beer bottle is embossed with REGISTERED / LIBERTY BREWING CO. / TRADE (Statue of Liberty) MARK / SPRINGFIELD, MASS. It has a capacity of approximately 13-14 oz. , has a tooled crown finish, and was produced in a post-bottom mold with all of the locatable air venting hidden in the embossing pattern. These diagnostic features that would indicate production between about 1900 and 1914 or so. A check of Van Wieren (1995) indicates that the Liberty Brewing Company was in business under that name from 1901 to 1911, fitting nicely with the diagnostically determined date. 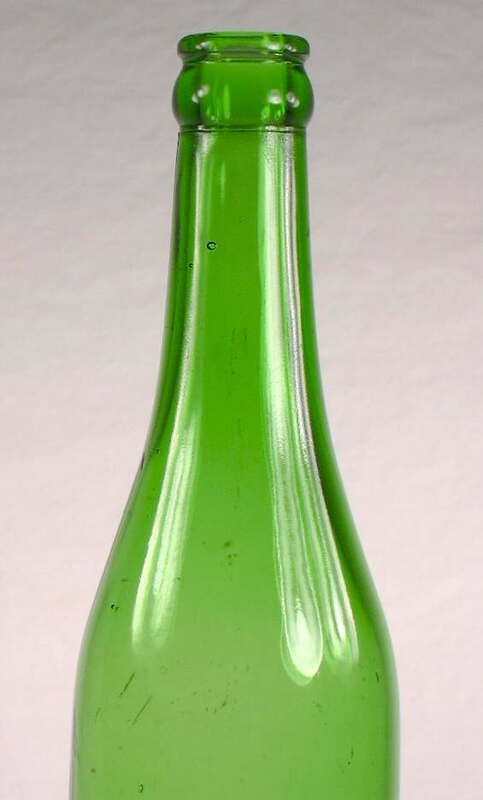 Fredericksburg Bottling Co. - This mouth-blown, crudely made, olive green champagne style "quart" (probably 24-26 oz.) 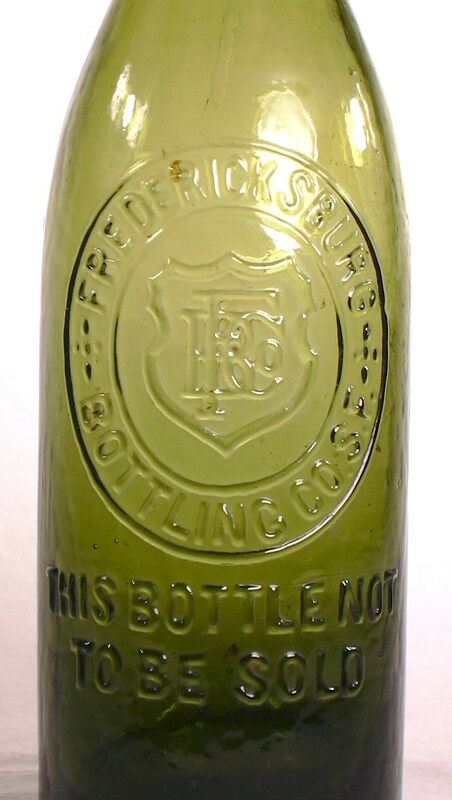 beer bottle is embossed with FREDERICKSBURG / (emblem with F B Co inside of a shield) / BOTTLING CO. S. F. / THIS BOTTLE NOT / TO BE SOLD. This bottle is very reminiscent of the apollinaris mineral water bottles except with a taller "blob" finish and body embossing (also covered later on this page). According to Tom Quinn (in an excellent article in Thomas  which was based on a lead in May Jones's ) - these bottles, as well as scores of other different beer (export and champagne) and cylinder liquor bottles, were made in Germany for various far West Coast brewing and liquor companies (primarily California with some in Oregon, Washington, and British Columbia); often for companies with German surnames or themes (like Fredericksburg) (Martin 1973). These German-made bottles - or at least the ones with U. S. embossing - seem to be a phenomena of just West Coast brewing and liquor companies which is believed related to a connection with several importers in the Bay Area of German ancestry (Abramson & Heunisch in the early 1880s; possibly others later). It is thought that these bottles were primarily made by the massive Dresden Glass Industry Corporation (Dresden, Germany) which was the largest bottle manufacturer in the world in the late 19th century. 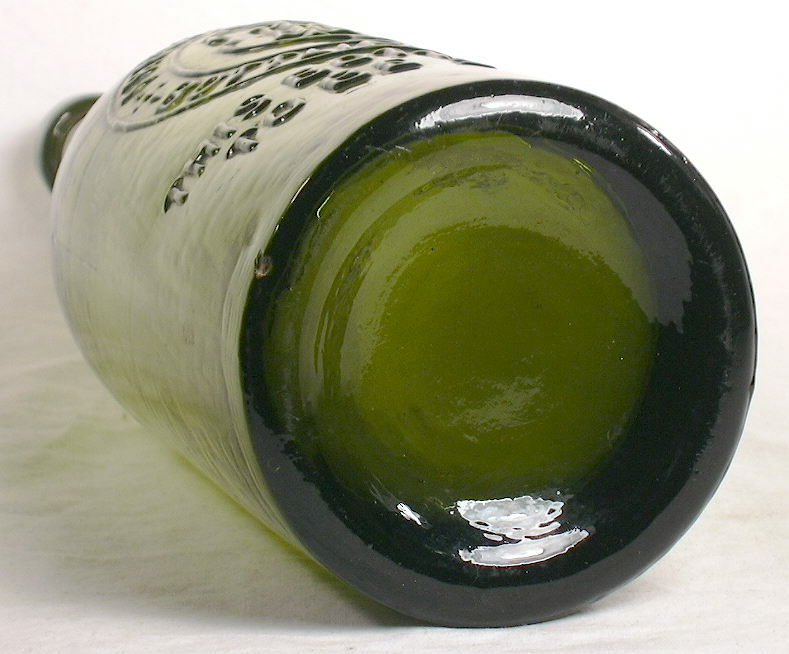 The binding characteristics of these German bottles are: thick, heavy olive green, red-amber or colorless (non-manganese decolorized) glass; non-era typical body crudeness in the form of copious whittle marks and often unusual horizontal "ripples" on the lower body; crude "true" applied finishes; a glossy sheen to the bodies indicating fire polishing; and typically cup-bottom mold conformations for bottles that would otherwise have been mostly post-bottom molded during that era (Thomas 2002; empirical observations). 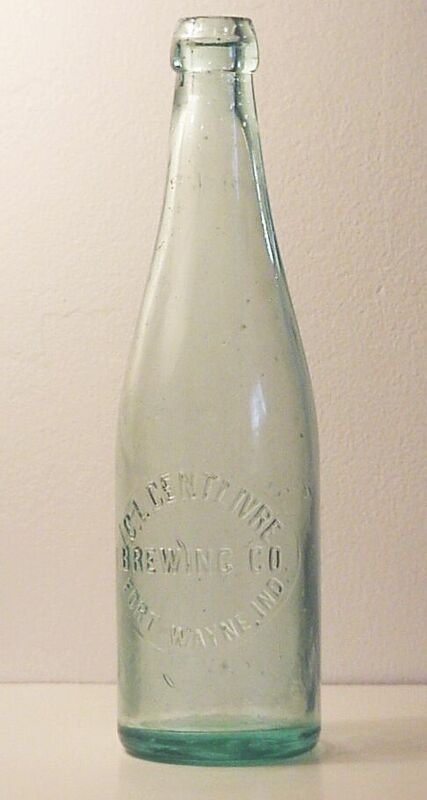 The pictured bottle likely dates from 1889 to 1893 as the company was doing business as the Fredericksburg Brewing Co. during that time frame (Van Wieren 1995). Click on the following links to view more images of this bottle: base view (cup mold base, though not evident in image); close-up of the shoulder, neck and finish showing the crudely applied tapered (outward towards the base) "blob" finish; close-up of the embossing showing some of the body "whittle"; close-up of the lower part of the body and the noted, though vague, horizontal "ripple" marks often seen on these German-made bottles. See Quinn's article in Thomas (2002) for the complete story on these bottles which date generally from the mid-1880s until National Prohibition; even the later bottles (1900 to late 1910s) have the noted "earlier" manufacturing characteristics. It should also be noted that unembossed bottles with very similar characteristics are often noted on historic sites of the same era throughout the U. S.. Dating Summary/Notes: As noted, the champagne style of beer bottle was made for an extremely long time, i.e., from at least the late 1870s continuously up to the present day, which like with the export style, is an amazing run of time. Mouth blown examples were produced in both turn molds and two-piece molds with either a cup-bottom or post-bottom mold configuration. The champagne style was more popular in the East and Midwest than in the West, though several Western examples are pictured here (Martin 1973; Ayres et al. 1980; Lockhart & Olszewski 1994; Mobley 2005). The only real changes to the style over time have been the method of manufacture (mouth-blown to machine-made which occurred largely between 1912 and 1915) and the use of modern finishes/closures in the 20th century (crown cap and external screw threads). 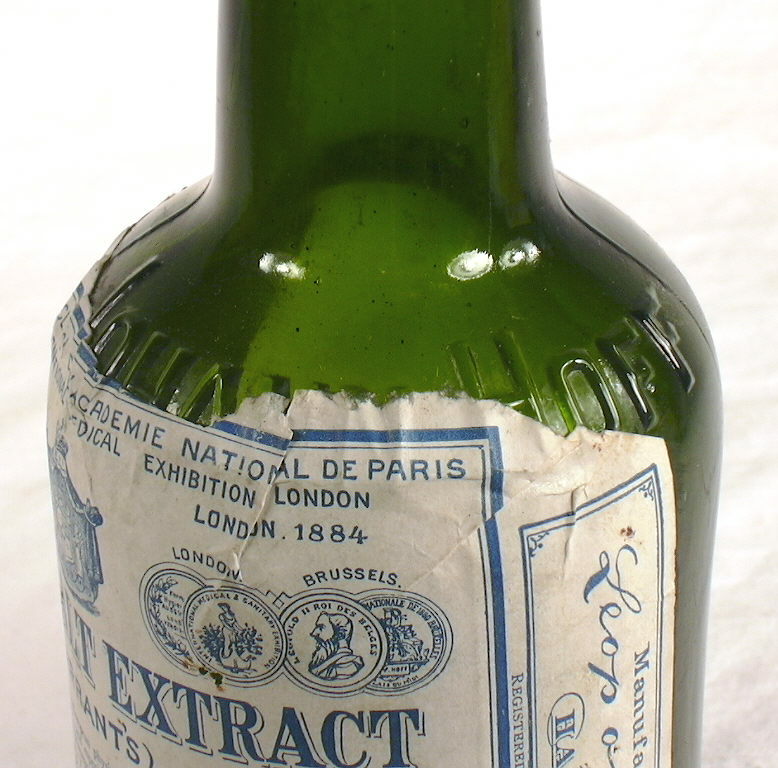 Given this, the general dating of the export style bottle must be done using manufacturing based diagnostic features - see the Bottle Dating pages for more dating information - or by searching the historical record when the company or product related embossing or labeling allows for such like some of the bottle pictured here. One note on beer bottle finishes is that these were some of the last bottle types to be more or less fully converted from applied finishes to tooled finishes; many beer bottles from the early 1890s were made with applied finishes and tooled finishes were probably not ubiquitous until the mid to late 1890s (with the exception of the German-made bottles noted above). Although the two major styles noted above - export and champagne - dominated the beer bottle market, there were other styles which were quite popular also. 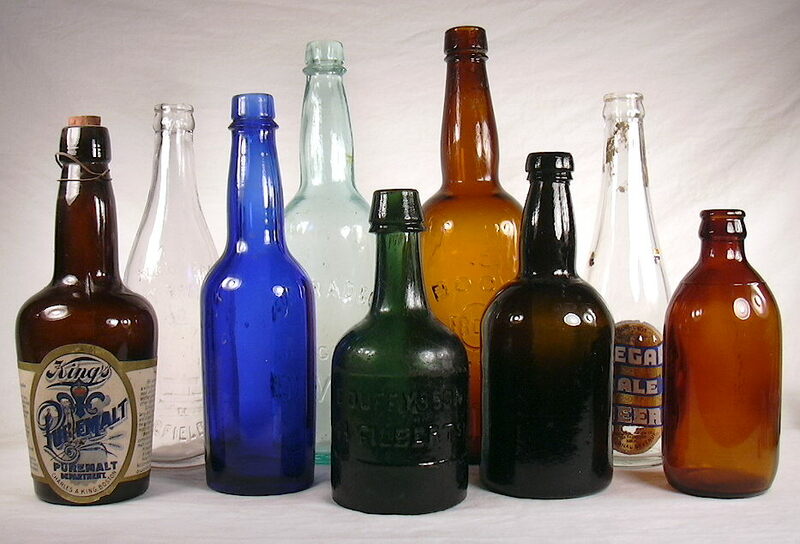 A handful of other more or less common bottle styles which contained beer or beer-like products are covered below; more may be covered in the future. This squatty shape is a distinctive style that was apparently closely associated with quasi-medicinal "malt tonic" and "malt extract" products, much of which may have been just beer by another name. Beer was and is made through the "mashing" of malted barley - a starch to sugar (maltose) conversion process - with the resultant sugars extracted from the grain through an infusion process known as "sparging." This produces a diluted "malt extract" which is then fermented with specific yeasts to produce beer (Papazian 1991). It is likely that the malt extract/tonics which came in the style of bottle pictured to the left were carbonated since these bottles are heavy and sealed with closures which were typically associated with carbonated products (wired down corks, Lightning stoppers, crown caps). The narrow neck and bore also implies that these bottles were intended for a very liquid substance. i.e., beer or something like it in consistency. This style is typified by being "squatty", having a relatively short moderate width body and a relatively long neck; the body height is usually just a bit less than the combination of the shoulder, neck, and finish. The body tapers distinctly inward from the shoulder to the heel, though the amount of taper varies as shown by the two bottles pictured - to the left and at the bottom right, which is just barely tapered. This bottle style can be found mouth-blown or machine-made with finishes appropriate for accepting corks, Lightning type stoppers (blob type finish like to the left) or crown caps (lower right). External screw threads have not been noted on this style but are possible. To view the page from the 1906 Illinois Glass Company bottle catalog that offered a "malt extract" bottle in a 14 oz. size identical to the bottle pictured to the left, click IGCo. 1906 catalog - pages 258-259; the malt extract bottle is illustrated in the lower right hand corner of the right page (IGCo. 1906). This style was also called the "squat malt", "squat tapered tonic", "near-beer" (Prohibition era), and likely other names by bottle makers (Illinois Glass 1920; Obear-Nester 1922; Fairmount 1930s). Undoubtedly, these squatty malt extract/tonic bottles were also used for regular beer, though the medicinal or health promoting (according to the producers) malt extract/tonic products are believed to be the primary intended use of these type bottles as indicated by the names used by the glass makers noted earlier. During the two or three decades leading up to National Prohibition in early 1920, many alcoholic beverage producers made the ultimately futile attempt to make their products more acceptable in a climate of growing temperance fervor by promoting medicinal qualities. Many malt tonics made just prior to (and during) Prohibition were indeed non-alcoholic. However, it must recognized that many people (even today with some scientific justification) believed alcoholic beverages had useful medicinal qualities (Young 1961). Hops were also believed to have medicinal "tonic" effects and were noted to be useful for "general or local debility associated with wakefulness, enfeebled digesting, etc." (Frederick Stearns 1886). 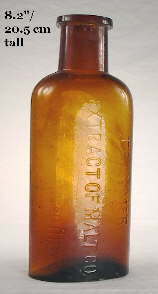 In fact, these malt extract/tonics were usually sold through druggists as evidenced by an 1895 advertisement for "Teutonic - A Concentrated Liquid Extract of Malt and Hops" which was bottled in the malt extract/tonic style of bottle and claimed to be good for "convalescents, nursing mothers, sufferers from insomnia and dyspepsia" ; it was available "at all druggists" (Anderson 1973). 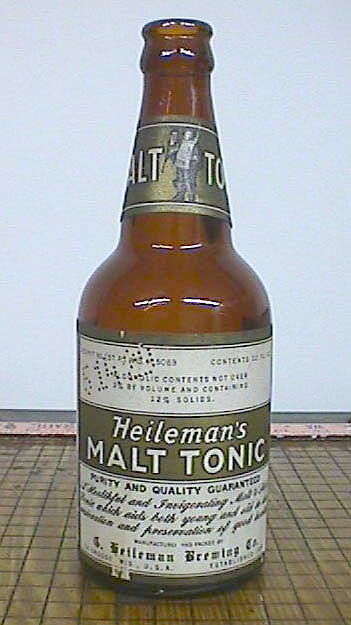 For an example of a malt tonic that was likely made just before National Prohibition was the law-of-the-land, click Heileman's Malt Tonic (Heileman Brewing Co., La Crosse, WI. - 1890 to 1962) to view a picture of a machine-made labeled example that likely dates between about 1915 and 1919 (Bull et. al. 1984). The ca. 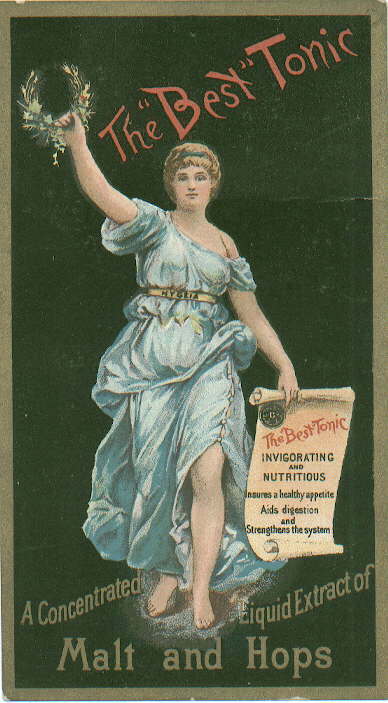 1880-1889 trade card to the left advertises "The "Best" Tonic" which was a "Concentrated Liquid Extract of Malt and Hops" which claimed (on the reverse side of the card) that it "Aids Digestion, Cures Dyspepsia, Strengthens the System, Restores Sound Refreshing Sleep, Priceless to Nursing Mothers." This product was produced and bottled in the malt extract/tonic style of bottle by the Phil. Best Brewing Company of Milwaukee, WI. 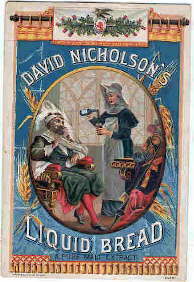 (1873-1889) which also produced an extensive line of "regular" beers such as "Bohemian", "Export" (in an export style bottle of course), "Bavarian", "Hofbrau", and "Select" (in a champagne style bottle). In 1889, this company became the Pabst Brewing Company. 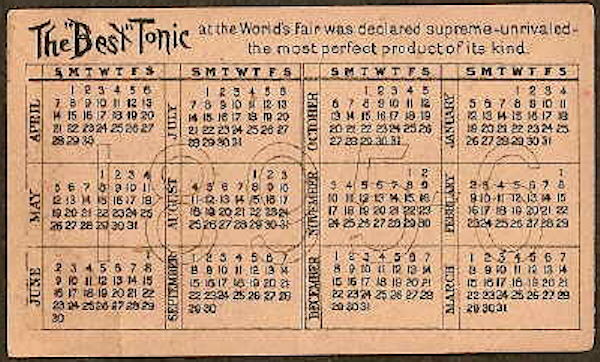 Click "The Best Tonic" to see a trade card with an 1895 calendar on the back that was given out by Pabst for the same product, but which also shows the bottle on the card. Many breweries produced malt and hops based medicinal products, including the Anheuser-Busch Brewing Company which produced a product called "Malt-Nutrine" during the early 20th century (Anderson 1973). The malt extract/tonic bottle pictured in the upper left hand corner of this box has the original labels and is embossed on the base with PUREMALT, DEPT / CAKING / BOSTON, MASS. It was produced by the Charles A. King Company, which was Boston, MA. brewery which operated under this name between 1883 and 1896 (Anderson 1973; Bull et. al. 1984). 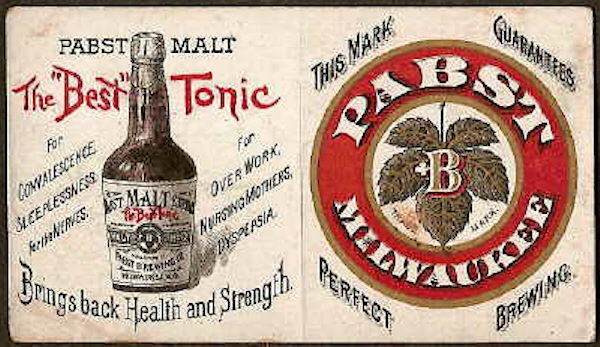 The label notes that "Puremalt" provided the same medicinal qualities as noted for the "The Best Tonic" previously discussed. 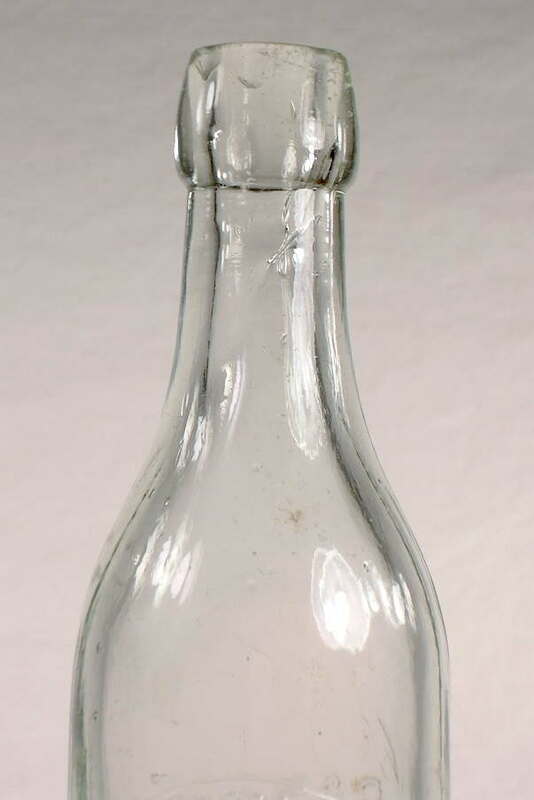 This bottle was produced in a two piece post-bottom mold, has multiple shoulder air venting marks, and a tooled blob style finish which makes it likely to date from the latter end of the noted business range for the company, i.e., 1890s. This bottle also has the original cork and the wire that held it in place, presumably to offset the pressures of carbonation. 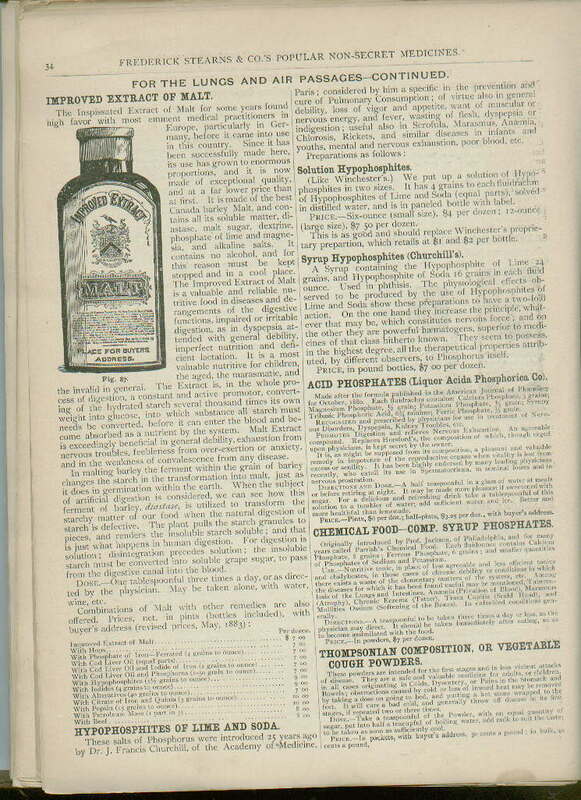 Identical bottles were also advertised in 1895 for "TeuTonic" which had the image of a Viking-like man on the label and claimed to be good for "Convalescents, Nursing Mothers & Those suffering from Insomnia" (Richardson 2003). 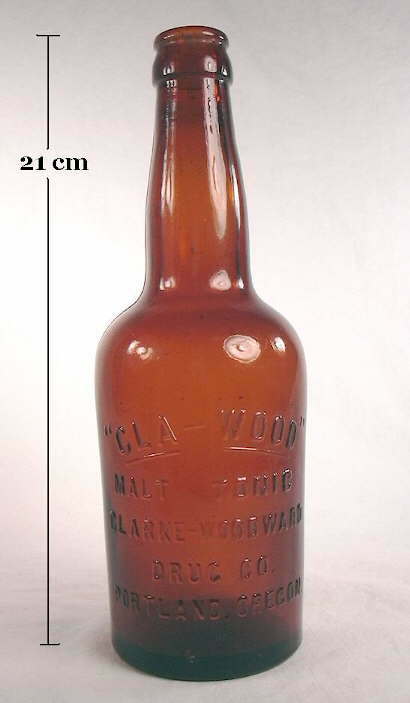 The bottle pictured to the right is a crown cap finish example of this style that is embossed "CLA-WOOD / MALT TONIC / CLARKE-WOODWARD / DRUG CO. / PORTLAND, OREGON that was produced between about 1906 and 1916. This company also marketed a "Cla-Wood Malt Extract" which was likely similar to the "Extract of Malt" products discussed earlier (White 1974). This bottle was mouth-blown in a cup base mold, has multiple air venting marks on each shoulder, and a tooled crown finish. The crown finish was increasingly popular on mouth-blown soda and beer bottles from the late 1890s up until virtual complete conversion to machine-made crown finish bottles around 1915 to 1917 for beer and soda bottles (Lockhart pers. comm. 2003). 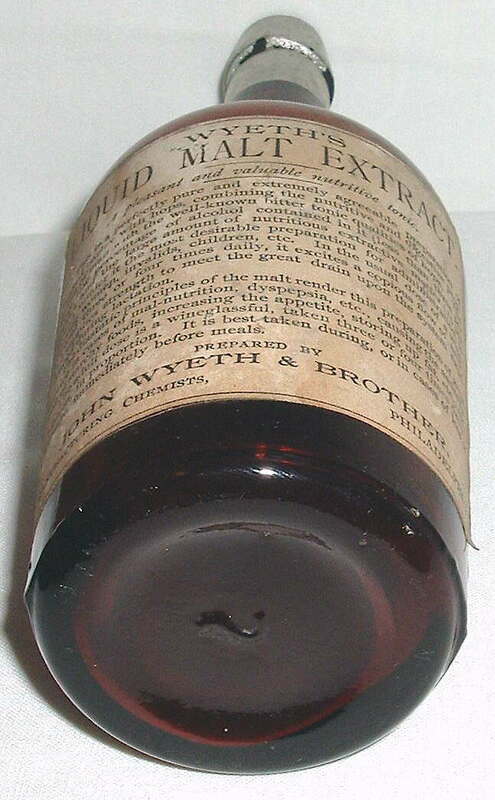 Wyeth's Liquid Malt Extract - This commonly encountered late 19th to early 20th century mouth-blown bottle is embossed vertically on one side with JNO. WYETH BRO. / PHILADELPHIA / LIQ. EXT. MALT. 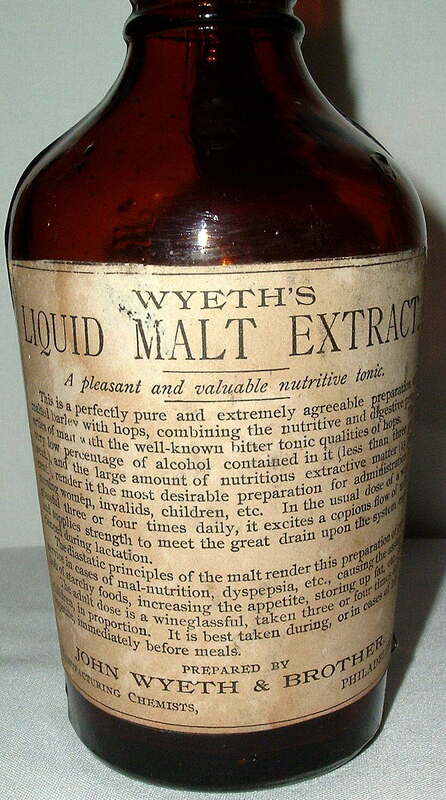 The label notes that the product is "Wyeth's Liquid Malt Extract" which is "A pleasant and valuable nutritive tonic" with an alcohol percent of "...less than three percent." John Wyeth & Brothers is a very old concern founded in 1860 and still in business today (see www.wyeth.com). 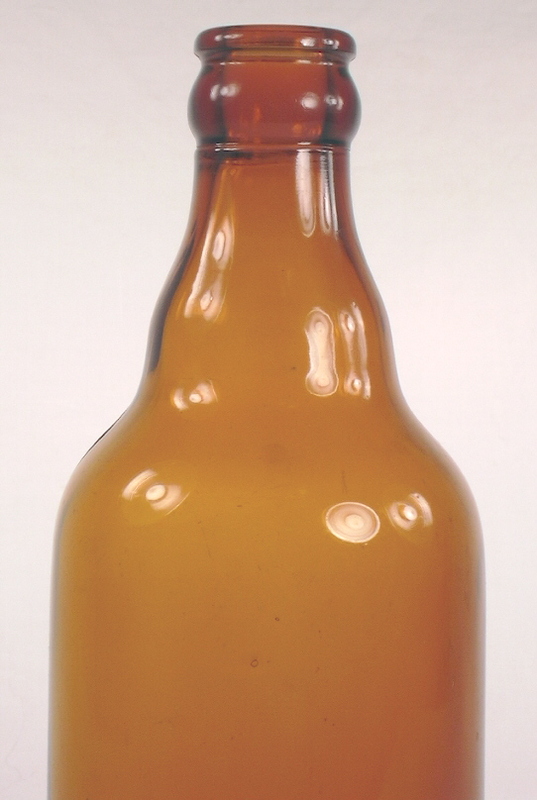 The product was advertised as early as the 1870s and as late as 1921, although the typical embossed bottles like the one pictured here date from the 1890s to 1910s era (Fike 1987). 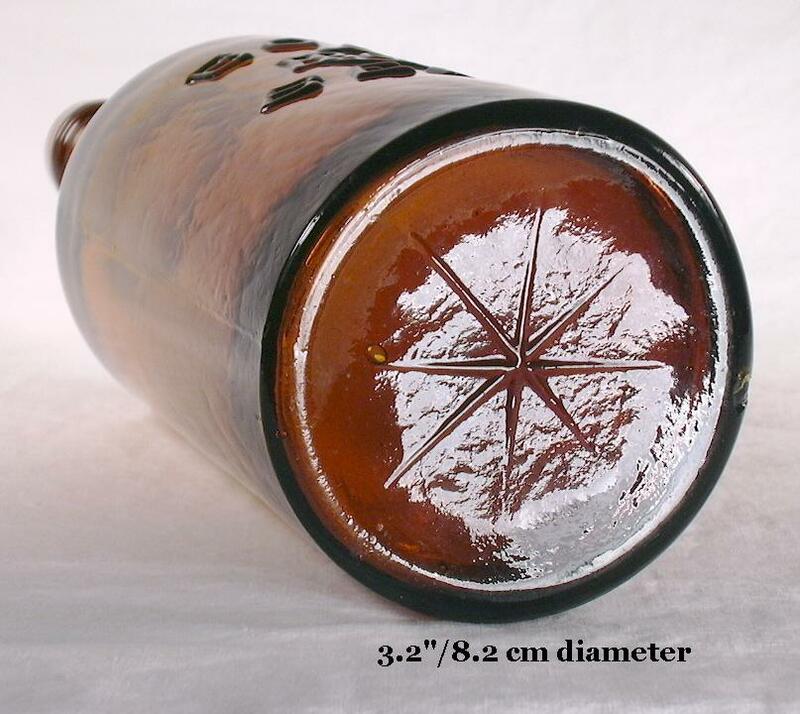 The bottles are approximately 9" tall, have a tooled oil finish, were blown in a cup base mold with air venting marks, and have two distinctive molded rings at the base of the neck. The lower finish and upper neck are also unique in that just below the outwardly flaring oil finish is a concentric groove where the base of the finish and upper neck merge. 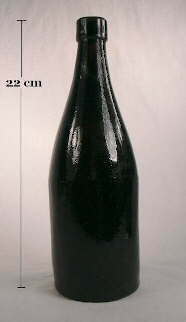 Click on the following links to view more images of this bottle: base view showing the cup base mold conformation; close-up of the original label; close-up of the neck and finish showing the original foil capsule which covered the cork, finish, and upper neck. 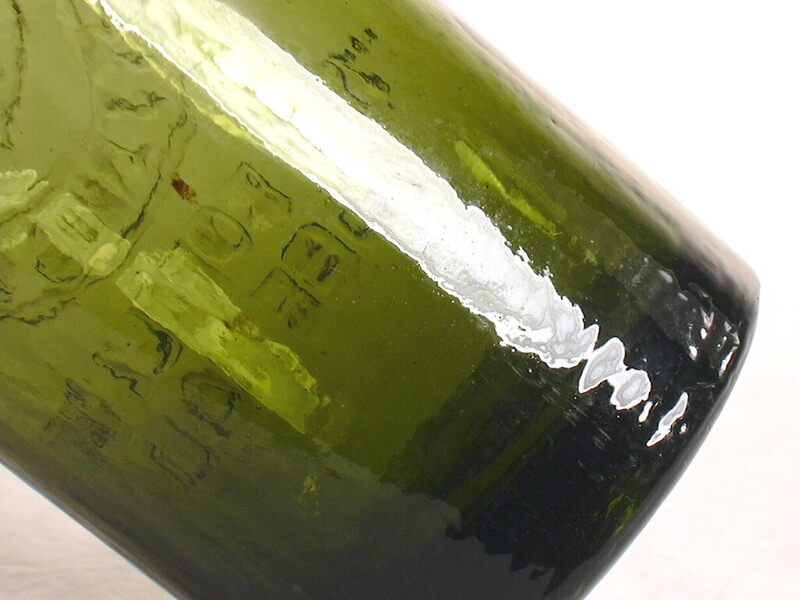 This last image also shows faintly the noted concentric groove where the base of the finish and top of the neck meet - a feature largely unique to this bottle. 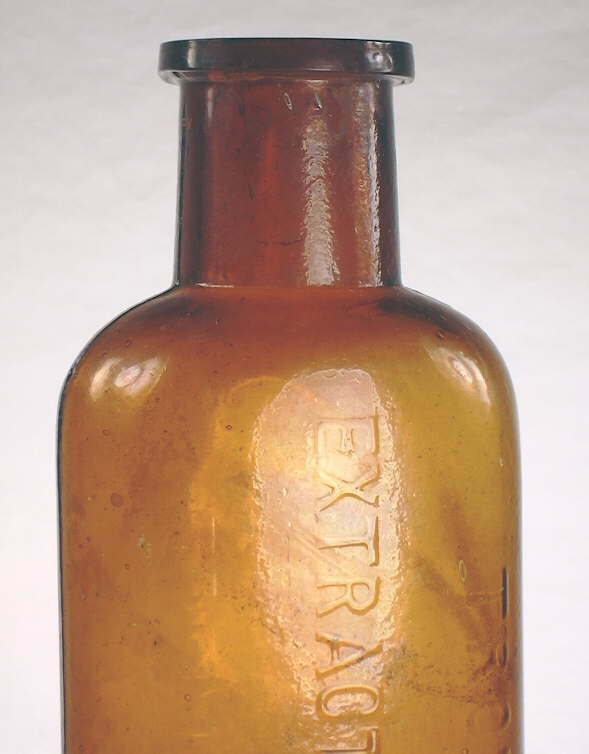 Hoff's Malt Extract - This is another commonly encountered late 19th to early 20th century mouth-blown malt extract bottle which is embossed on the shoulder with JOHANN HOFF (partially obscured by the label on this example). 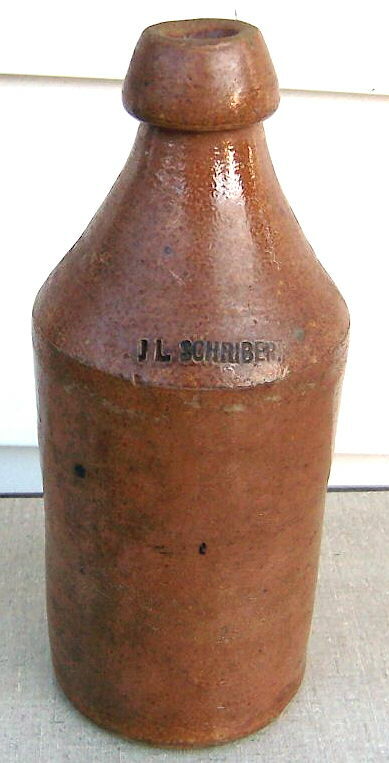 The pictured bottle is 7.5" tall, 2.9" in diameter, has a tooled oil finish, and was blown in a cup base mold with single shoulder air venting indicating an 1890s to early 1900s production. 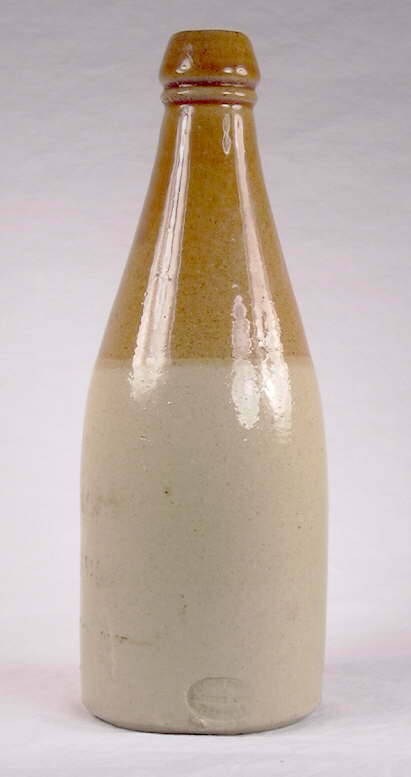 The Johann Hoff bottles are a variation of the "squatty" shape noted above, but may actually be the bottle that initiated the malt extract style as the Johann Hoff product was first introduced in Europe in 1847 (Fike 1987). These bottles are also very similar in shape to the early ale/porter bottles discussed previously on the page. The label notes that the product was "A dietetic and healing remedy recommended by European physicians for Complaints of the Chest and Stomach, Dyspepsia, Obstinate Coughs, Hoarseness, etc. and especially Consumption..." - in other words, the manufacturers considered the product to be a medicine or at least health enhancing. 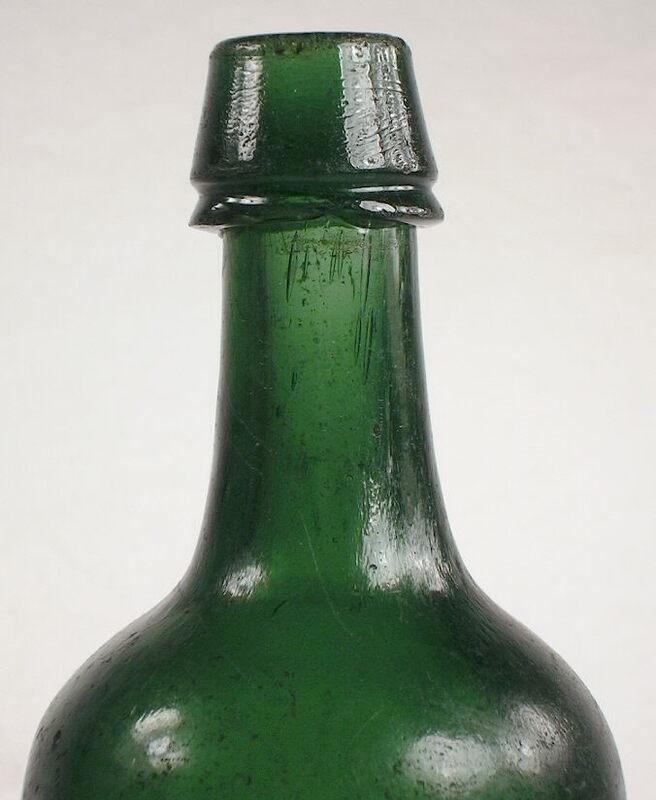 Older versions of this bottle (1880s and prior) have applied finishes and are olive green to olive amber in color and are often quite crude (empirical observations). How far back this particular bottle style goes is unknown, but to at least the 1870s in the U. S.; Fike (1987) noted it being introduced into the U. S. in 1866 although what bottle it came in is unknown. The product was imported into the U. S. by Tarrant & Co. (New York) which is noted on the label shown here. Later (1890s and after) mouth-blown examples were amber or emerald green (pictured example) in color. Machine-made examples have not been noted by the author, but could exist since the product was produced until at least 1935 (Fike 1987). 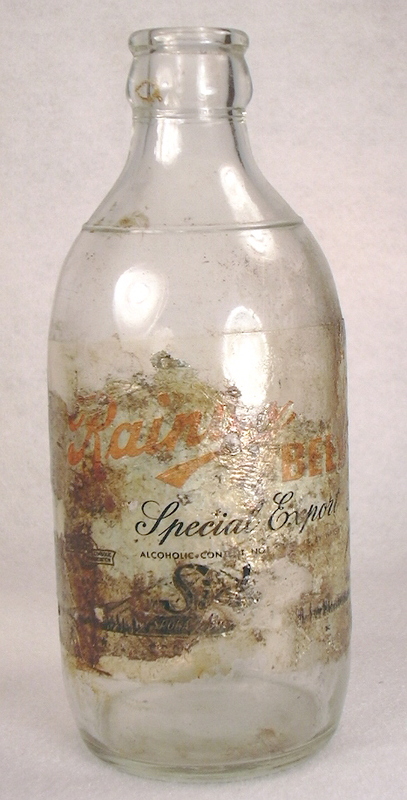 Click on the following links to view more images of this bottle: base view showing an embossed "X"; close-up of the shoulder showing the embossing partly covered by the label; close-up of the neck and finish. Whether these bottles were made in Europe and imported full or were made in the U. S. and filled with the imported product is unknown, though the illustrated bottle does have the look of a U. S. made bottle. Dating Summary/Notes: The malt extract/tonic style of bottles shown here typically date from the mid to late 1880s at least through National Prohibition and into the 1930s. Mouth-blown examples were produced in both turn molds and two-piece molds with either a cup-bottom mold or occasionally a post-bottom mold configuration. Mouth-blown examples date from the apparent initiation of the style in the 1880s to the mid to late 1910s. Mouth-blown examples with a blob finish bottles likely date no later than the very early 1910s with crown finish bottles from the early 1900s to late 1910s. Machine-made examples almost always have a crown finish and date from possibly as early as 1905, though most would date from the mid 1910s or later (IGCo. 1902, 1911, 1920; Obear-Nester 1922; Miller & McNichol 2002; empirical observations). These bottles are virtually always seen in some shade of amber glass though other colors are possible. As with the other beer bottles noted before finishes on these bottles were also among the last bottle types to be more or less fully converted from applied finishes to tooled finishes; many extract/tonic beer bottles from the early 1890s were made with applied finishes and tooled finishes were probably not ubiquitous until the mid to late 1890s. Another beer bottle style - several styles actually - popular during the late 19th century and first couple decades of the 20th century were intended for wheat or "weiss" beer. Weiss beer is a northern European style that was brought to the U.S. by German and Belgium immigrants in the 19th century. It is made from a mix of malted barley and wheat, with the wheat usually composing at least half of the mash and fermented with different strains of yeast than used with regular beer. The resulting brew is relatively light, aromatic, yeasty, and effervescent. Weiss beer appears to have died out with National Prohibition though the style has seen a significant revival with the micro-brewery boom of the past couple decades (Anderson 1973; Papazian 1991). There are two main types of weiss bottles which both essentially take the steep but gentle sloped shoulder form of the champagne style and alter it - one with a wider body (picture to the left) and the other with a narrow, compressed body (pictured below right). 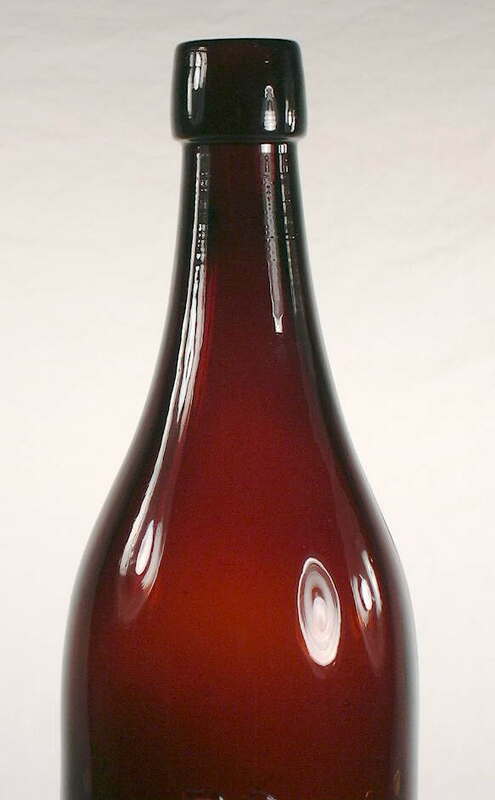 Weiss beer was also frequently bottled in regular champagne style beer bottles (Mobley 2005). It appears that weiss beer was particularly popular in the East and Midwest given the numbers of bottles embossed with "weiss" on them from those regions. It must have been particularly popular in the St. Louis area as there are quite a number of embossed bottles from that area; one of the styles in the early 20th century Illinois Glass Company catalogs was actually called the "St. Louis Weiss Beer" (IGCo. 1903, 1906, 1908, 1911; Anderson 1973; Mobley 2005). The weiss style was apparently not as popular in the West as there are few if any embossed examples of weiss beers from that area (Wilson & Wilson 1968; Martin 1973; Preble 1987; Miller 1999). However, there were "weiss breweries" in a few places in the west including Portland, OR. (Portland Weiss Brewing and Bottle Co. - 1902-1904) and Los Angeles, CA. (Berlin Weiss Beer Brewing Co. - 1907-1911) but none of the companies apparently used bottles embossed with their name and/or product (Bull, et. al. 1984). The amber, 7" tall, bottle pictured to the above left is a an example of the "squatty" weiss beer style. It is embossed CARL E. BELTZ & CO. / WEISS BEER / CLEVELAND, O. On the reverse it is embossed THIS BOTTLE / IS / NEVER SOLD with C. G. CO. at the heel. It likely dates from the 1890s or early 1900s and has a blob style finish with a Lightning closure. This picture was taken off eBay® so additional details about its manufacture are unknown, i.e., whether it has a tooled or applied finish and if there are air venting marks. The letters on the heel certainly stand for the glass maker who made the bottle, although there were many glass makers with those initials during the late 19th to very early 20th century when this bottle was made making it impossible to confidently attribute at this time (Toulouse 1971; Lockhart pers. comm. 2008). 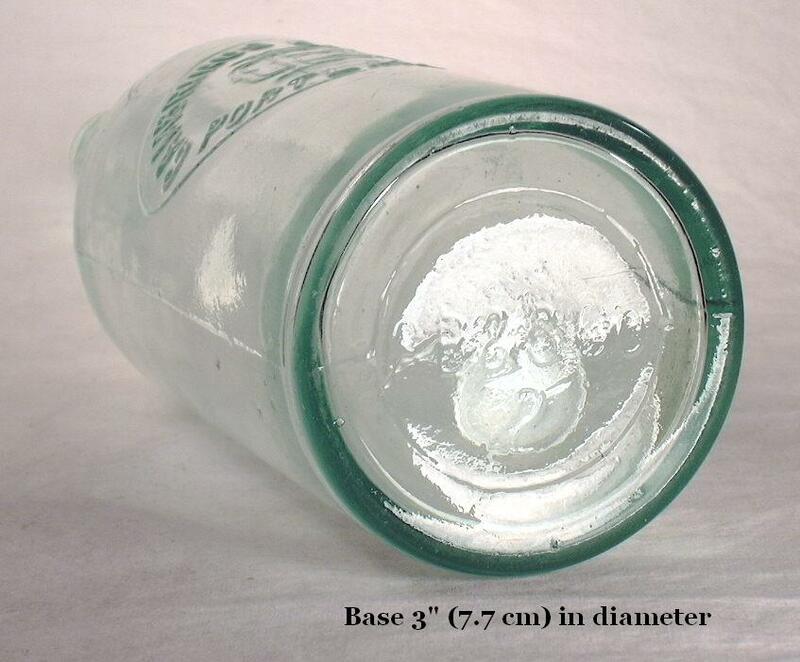 This general style was called the "Squat Weiss Beer" in the early 20th century Illinois Glass Company catalogs (IGCo. 1903). Bull, et. al. (1984) does not specifically mention Carl E. Beltz & Co. but does note various Beltzs' in the brewing business between 1876 and 1906, including "Jos. Beltz & Sons" from 1897 to 1901. It is possible that Carl was a son? These types of inconclusive tidbits of information demand more local research to pin down more specifically. The slender, medium amber weiss beer bottle style pictured to the right - without a distinct shoulder/neck break - is embossed inside of round plate with COLUMBIA / WEISS BEER / BREWERY / ST. LOUIS, MO. 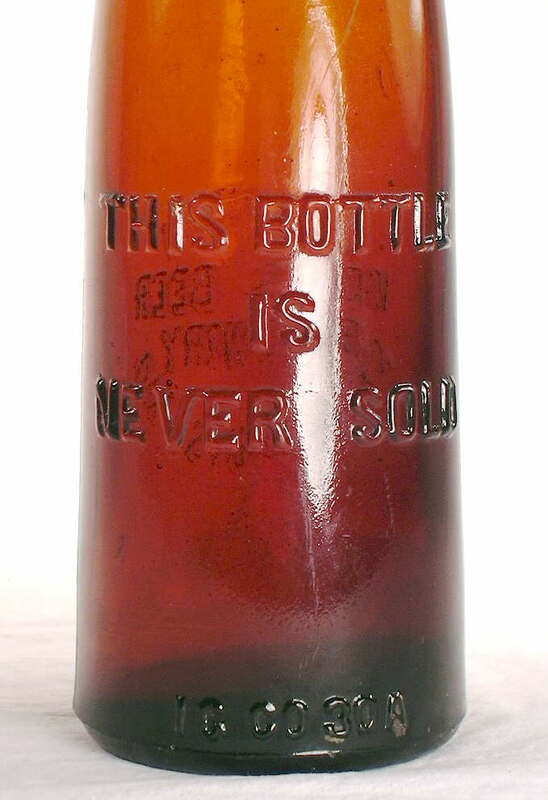 On the reverse it is embossed THIS BOTTLE / IS / NEVER SOLD along with I. G. Co. 30A at the heel. 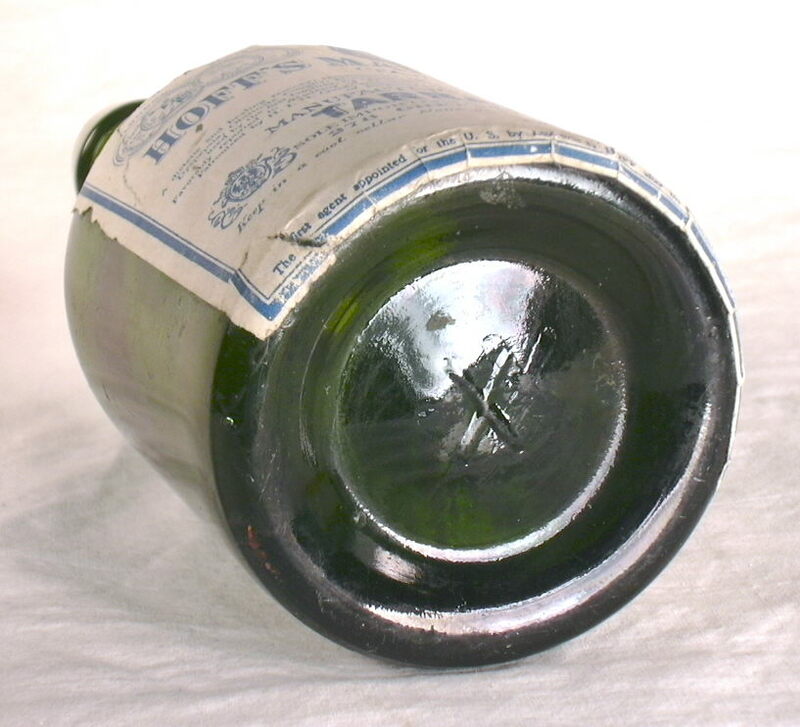 The heel lettering indicates that this bottle was made by the Illinois Glass Company who offered mold number 30A from at least 1903 (but not as early as 1899) to 1911 giving a high probability dating range for when this bottle (IGCo. 1899, 1903, 1906, 1908, 1911). Click on the following link to see the actual listing for this mold number (30A) in the 1906 Illinois Glass Company catalog - IGCo. 1906 catalog - pages 258-259; mold 30A is in the lower left hand corner. Appropriately enough, IGCo. called this style the "St. Louis Weiss Beer." Other available styles nominally intended for weiss beer are also shown on these catalog pages. This bottle has a tooled blob finish and was blown in a cup base mold with multiple shoulder air venting. It also has the original porcelain lightning stopper in place which is marked with the brewery name on top. 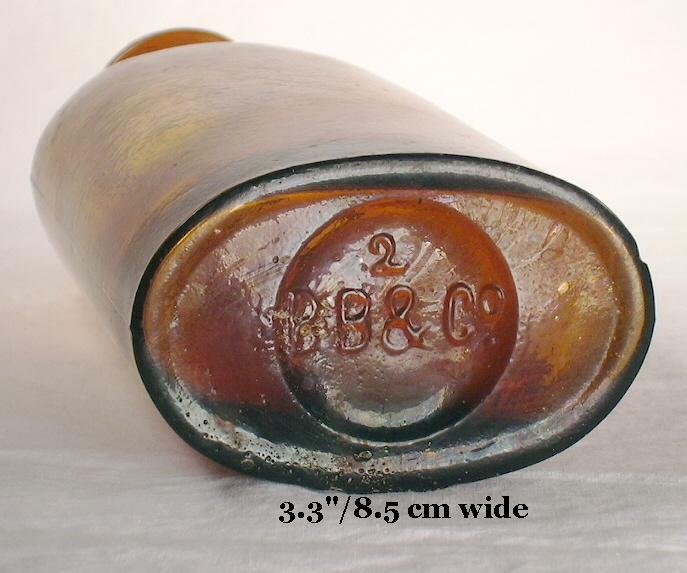 Click on the following links to view more pictures of this bottle: base view; close-up of the shoulder, neck, and finish/closure; reverse view; close-up of the reverse showing the noted embossing, including the noted mold number (bottom of picture). A check of Bull, et. al. (1984) indicates that the Columbia Weiss Beer Brewery operated under that name from 1898 to 1909, consistent with the likely manufacturing based date range estimate and the IGCo. catalogs. The bottle pictured at the following link - C. L. CENTLIVRE / BREWING CO. / FT. WAYNE, IND. (embossed in a round plate) - is very similar in shape, size, and likely age to the Columbia Weiss Beer bottle pictured above. The base of the bottle is also embossed with "R. G. & B. Co." which is almost certainly a glass makers mark, but of yet unknown origin (Toulouse 1971; Lockhart pers. comm. 2005). 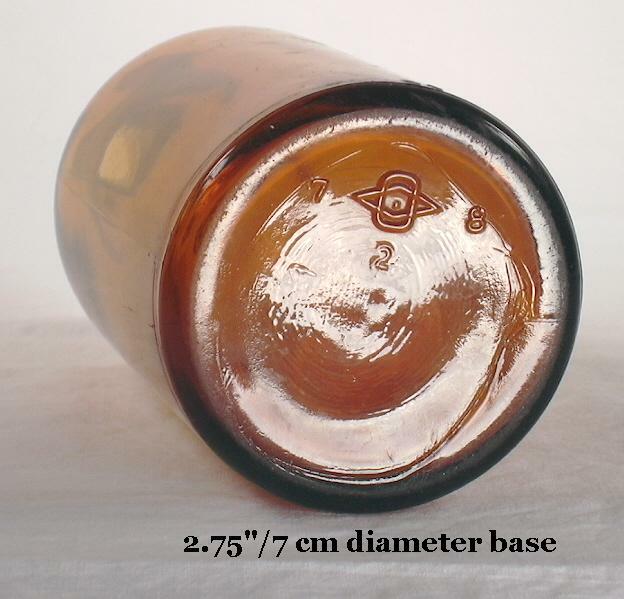 This beer bottle has a blob finish with the distinctive Baltimore seal "groove" inside the bore, multiple air venting marks, and was produced in a post-bottom mold. The C. L. Centlivre Brewing Company did business under this name from 1893 to 1918, which in hand with the diagnostic characteristics, indicate a manufacture of around 1895 to 1910 (van Wieren 1995). Though the bottle embossing does not indicate it was used for weiss beer, one could reasonably conclude that it was used for weiss based on the somewhat unusual shape which is strongly associated with that beer style. The bottle pictured to the left is another somewhat squatty - though less so than the example above - weiss beer bottle that is closer in overall conformation to the regular champagne beer style. It is embossed in a round plate with ANTHRACITE BREWING CO. / "WEISS / MT. CARMEL, PA. with REGISTERED on the shoulder. 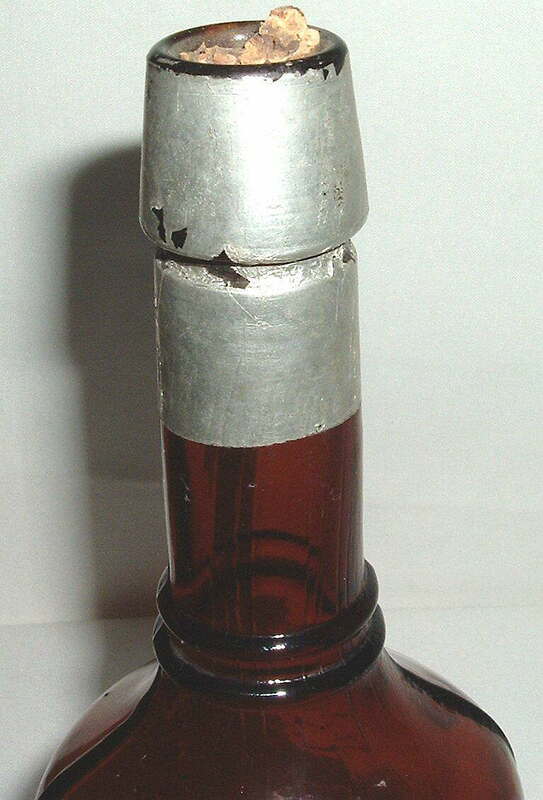 This picture was also taken off eBay® so additional details about its manufacture are unknown, though it appears to date from between 1900 and 1915 as it almost certainly has a tooled finish and colorless glass was much more common after the turn of the century in beer bottles than before 1900. In addition, bottles with "Registered" on the shoulder usually date from the no earlier than 1900 or so (empirical observations). A check of Bull, et. al. (1984) indicates that the Anthracite Brewing Co. was in business from 1897 to 1920, consistent with the noted bottle manufacturing based dating. Dating Summary/Notes: The weiss beer bottle styles covered here appear to have been made during the era between the mid 1880s and National Prohibition (1919-1920) with the style - beer and bottles - largely disappearing after that time. As noted, weiss largely disappeared until the late 20th century revival of the style (Anderson 1973, empirical observations). All examples of marked weiss beers noted by the author of this site have been mouth-blown, though some machine-made ones are possible during the 1910s. 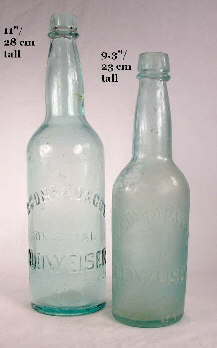 In general, the closer dating of these bottles must be accomplished using manufacturing based diagnostic features - see the Bottle Dating pages for more dating information - or by searching the historical record when the company or product related embossing or labeling allows for such, like the bottles pictured here. Like beer, soda and mineral water was (and is) typically highly carbonated demanding that the bottles used for containing the product be heavy glass for strength. It also required that the method of closure be air tight and dependable so that the carbonation could be retained until consumption. Given this, there are close stylistic similarities between beer and soda bottles (round in cross section, heavy glass, same or similar finishes/closures) as well pure crossover where soda/mineral water bottles were simply purchased and used by brewing companies. Though not particularly common after the Civil War, bottle types strongly identified with soda/mineral water were used on occasion for beer. A couple examples are pictured and described here, but not overly elaborated on. That is left for the Soda & Mineral water bottle typing page to cover. The blob finish soda to the left is embossed vertically down the front - H. FLOTO'S / LAGER BEER / READING, PA. 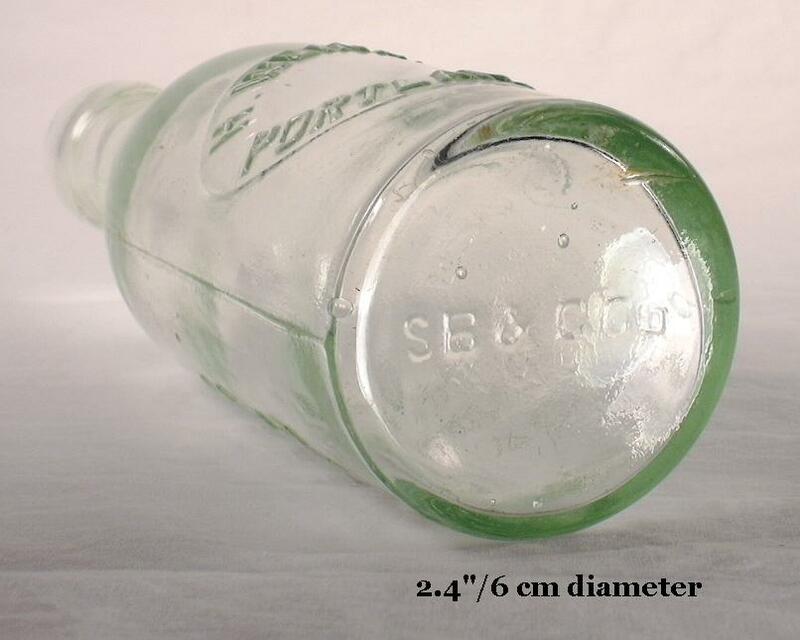 This bottle was obviously destined for lager beer but is a classic soda/mineral water shape (referred to by collectors as a "blob soda") that was popular for that product from the 1850s into at least the 1880s. 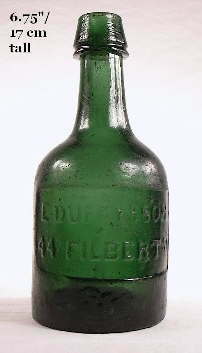 This particular bottle has a applied blob finish with some slop over onto the neck, was blown in a post-bottom mold, has a smooth base, and no air venting (and the resulting flatter, rounded embossing) indicating a manufacturing date range of 1865 to about 1885. With just the physical features of this bottle, that date range is the best that one can do in pinning down the date of this bottle. However, a check of Bull, et. al. (1984) lists Herman Floto as in business "circa 1884" - a date that is consistent with the end of the noted range. 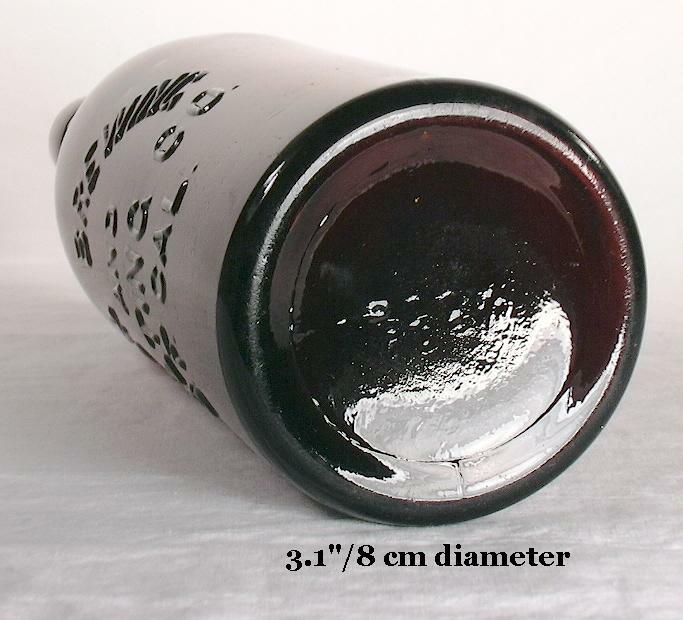 Click on the following links to view more pictures of this bottle: base view; close-up of the shoulder, neck, and finish. The Hutchinson type bottle to the right, which was almost exclusively used for soda/mineral water, was also apparently used to bottle beer as it is embossed FLA. BREWING CO. / (alligator) / TAMPA, FLA. This picture was taken off of eBay® so additional details about its manufacture are not precisely known, though it certainly has a tooled blob finish and probably has air venting. These diagnostic features would most likely date this bottle from the late 1880s to maybe 1910-1915. However, Bull, et. al. (1984) note that the Florida Brewing Company was in business under that name - at 5th Avenue and 13th Street in Tampa - from 1897 to 1919. Since Hutchinson sodas were little produced after about 1912 (crown sodas were the rule by that time) the date of this bottle is probably between 1897 and 1912 (Paul & Parmalee 1973; Lockhart 2001a). The bottle pictured to the left is an "apollinaris" style bottle that was commonly used between the 1880s and 1910s (mouth-blown) and 1910s and likely 1930s (machine-made). 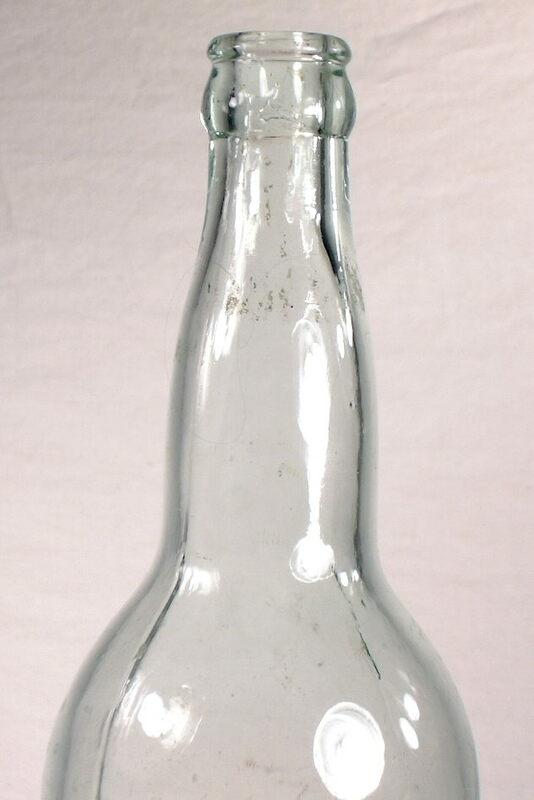 Though primarily used for mineral water, this type bottle was also used for lager beer from at least the early 1870s into the mid-1880s and in particular by the Anheuser-Busch Brewing Association (Wilson 1981; Lockhart 2007). 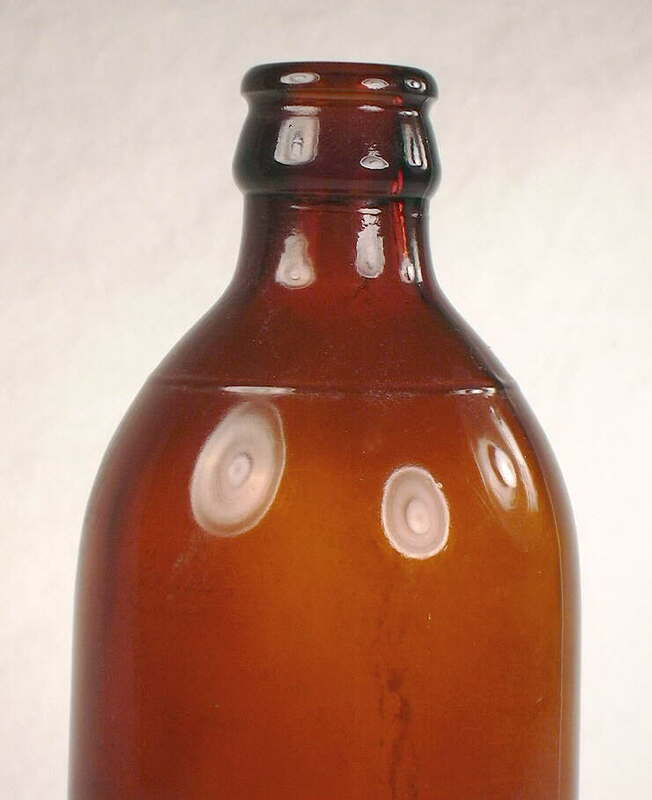 These earlier "apollinaris" type bottles were most likely blown in a two-piece mold (though might have been occasionally turn-molded) with true applied finishes. 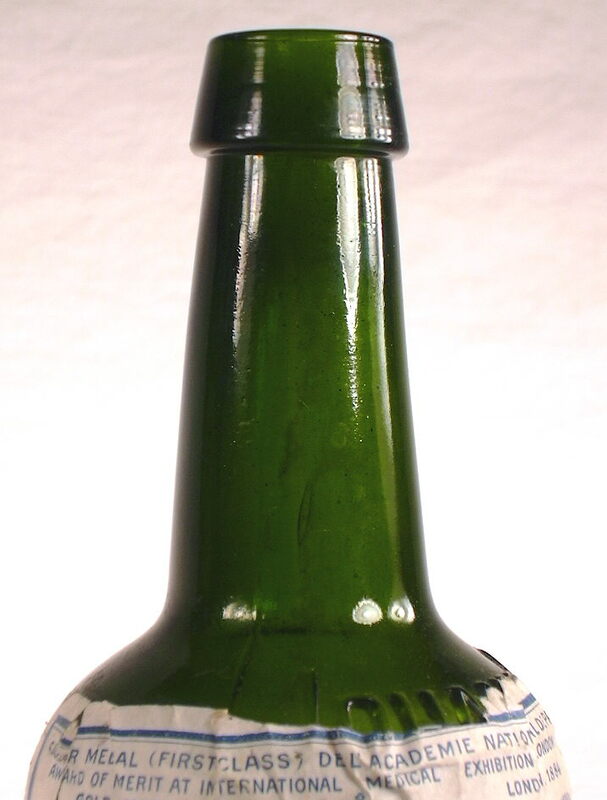 The pictured bottle was produced in a turn-mold, has a short tooled blob finish, a slightly indented base, and from the context of what other items it was found with (tooled finish beer bottles with some early wide-mouth machine-made items) most likely dates from about 1905-1910. This style was commonly called the "apollinaris" by bottle makers during the noted era. Click IGCo. 1906 catalog - pages 250-251 to see the actual catalog page from the Illinois Glass Company's 1906 catalog showing several sizes and types of apollinaris bottle (IGCo. 1906). Dating Summary/Notes: Since these specific styles of bottles are covered on the Bottle Typing/Diagnostic Shapes: Soda & Mineral Water Bottles page, no additional information will be presented here; see that page for dating related information. 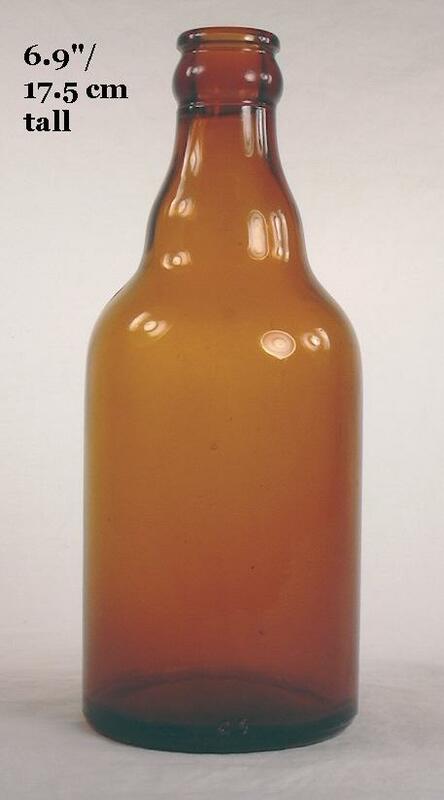 The "Stubbie" and "Steinie" beer bottle styles are purely of 20th century origin and were the glass industry's successful response to the rise of beer being "bottled" in cans in the mid-1930s - a perceived major threat to an important segment of the glassmakers markets. At least the Stubbie continued to be produced after the latest time period covered by this website (the 1950s); the Stubbie style was commonly used for American beers up into at least the late 1970s (empirical observations) and are still used by some beer brewers in the world today, e.g., Red Stripe Beer® (Jamaica). This class of bottles is typified by a relatively short body height (of the typical 11-12 oz. sizes) which is moderately wide, has a moderate shoulder pitch, and a short to moderate length neck depending which style. Both beer bottle styles (Stubbie & Steinie) were produced during a time when automatic bottle machines made virtually all utilitarian bottles, so they always have typical machine-made characteristics. Click on Bottle Dating: Machine-made Bottles Portion of the Dating Key to view the diagnostic characteristics of machine-made bottles. 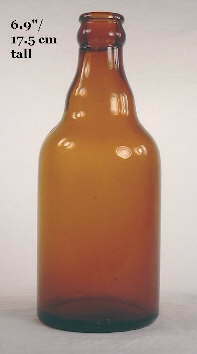 A large majority of these bottles from the 1930s through 1950s have a crown cap accepting finish, though the lower portion of the finish can vary or even be absent. The glass color is usually some shade of amber though a few colorless ones have been noted by the website author; click colorless Stubbie to see an 11 oz example. The linked bottle was used by the Rainier Brewing Company (Seattle, WA.) and has a faint though unmistakable Owens-Illinois Glass Co. marking on the base. There is also an even more faint plant code 20 for Oakland, CA. An unreadable single number date code without a dot (though not sure) is present indicating a likely late 1930s manufacture (Lockhart & Hoenig 2015). As a point of interest, the 11 oz. Stubbie bottles seem to be a totally Western American phenomena and are not used or seen in other parts of the U.S. (Schulz et al. 2019b). Most of these bottles are of moderately heavy glass since at least some were intended to be reused, though most were probably one use ("no return") bottles except during WWII when wartime conservation rules dictated re-usable bottles. Later (1960s on) versions were usually lighter glass and not intended for re-use at all. 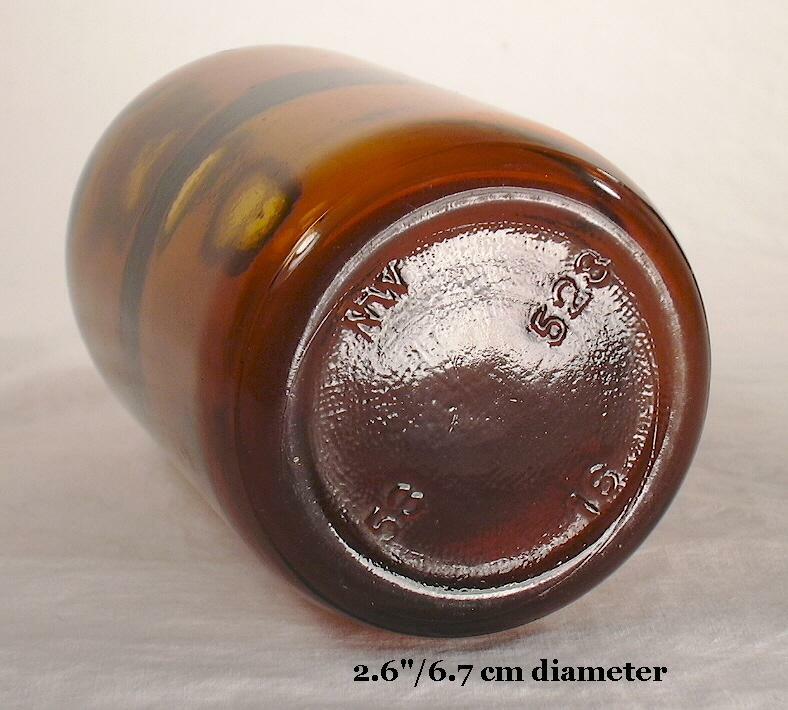 Many later examples were also made with external threaded finishes to accept screw caps; click Stubbie with external screw threads to view an example which is dated 1970. These bottles were almost exclusively used for beer and a few soda items like root beer (e.g., Mug Root Beer®), but did find some use for other products like orange juice (Schulz et al. 2019b). 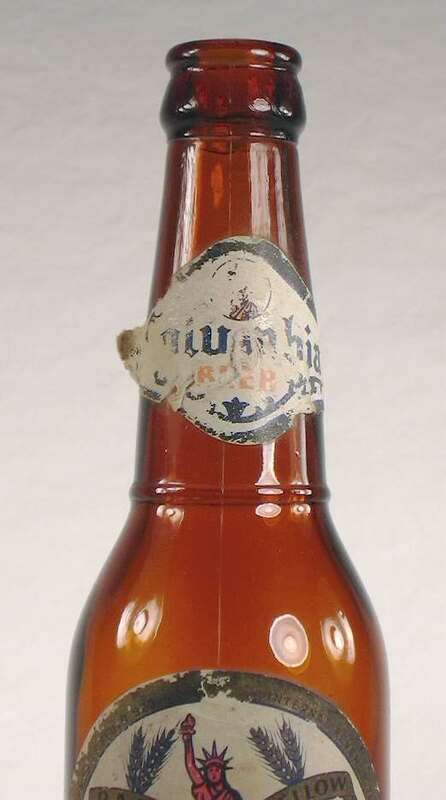 The Stubbie beer bottle is typically shaped as pictured above left and originated in1935. The classic Stubbie style has an almost non-existent neck, often an embossed ring on the mid-shoulder (possibly a fill line that allowed delineated the necessary head space), and a rounded lower body to heel section. Though originating in the mid-1930s, its zenith of popularity in the U.S. appears to have been from the mid to late 1940s well into the 1960s, though it was used as least into the 1970s in the U.S. and the early 1980s in Canada according to the website www.stubby.ca. (In fact, it was THE official Canadian beer bottle from 1961 to 1984.) As noted earlier, this style is still being used somewhat around the world. The pictured bottle has the usual 11 oz. capacity and a makers marking (connected NW) for the Northwestern Glass Company (Seattle, WA.) which was in business from 1931 to at least 1973 (Toulouse 1971; Schulz et al 2019b; empirical observations). The base also has an almost certain date code of "53" for 1953. Click on the following links to see more view pictures of this bottle: base view showing the "NW" maker's mark (top), "53" date code (left side), and Northwestern's beer mold number of "523" (right side); close-up of the shoulder, neck, and finish which shows the embossed shoulder ring which was a ubiquitous stylistic feature of the small stubbie beer bottles (empirical observations). The bottle pictured to the right is a full quart, "ruby red," quart Stubbie (although this size is not very "stubby") beer bottle used for bottling Schlitz™ beer. It is similar to the quart Steinie pictured below right, but with the absence of the neck bulge. Click base view to see such showing the makers mark for the Anchor Hocking Glass Co. who made these esthetically colored bottles for Schlitz™. 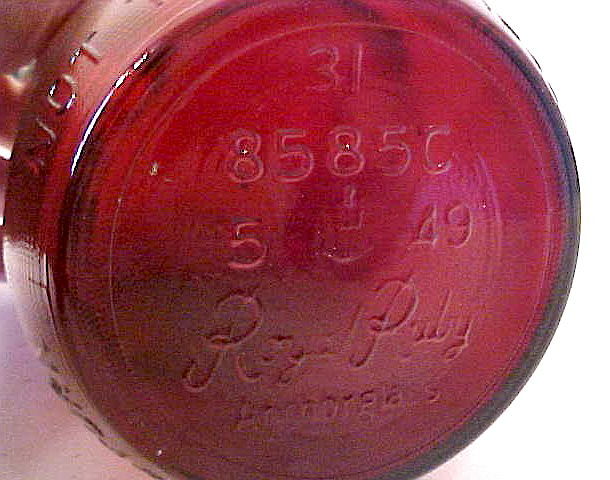 The base photo also shows the "49" date code indicating production in 1949. (Photos from eBay®.) Anchor Hocking produced various shaped ruby red colored beer bottles for Schlitz™ - including 12 oz. champagne and Stubbie bottles - from the late 1940s to early 1960s (empirical observations). A competing style to the Stubbie was the Steinie starting in 1936; an 11-12 oz. example of which is pictured to the left. It also has a short, proportionally wide body but with a longer, moderate length neck that has a distinct bulge or "step-up" and a fairly sharply angled body to heel area. This style with the step-up neck was apparently designed by the Owens-Illinois Glass Company in 1936 to vaguely mimic the taller and more well known export style beer bottle. It appears that the Steinie style was most popular from 1936 into the early 1950s (Schulz et al. 2019). The pictured Steinie is of the typical 11 to 12 ozs. capacity and is base marked indicating manufacture by the Owens-Illinois Glass Company (Alton, IL. plant as indicated by the "7" to the left of the "diamond O-I" mark) in 1938, as indicated by the "8" to the right of the "diamond O-I" mark (Toulouse 1971; Lockhart et al. 2018t & u). 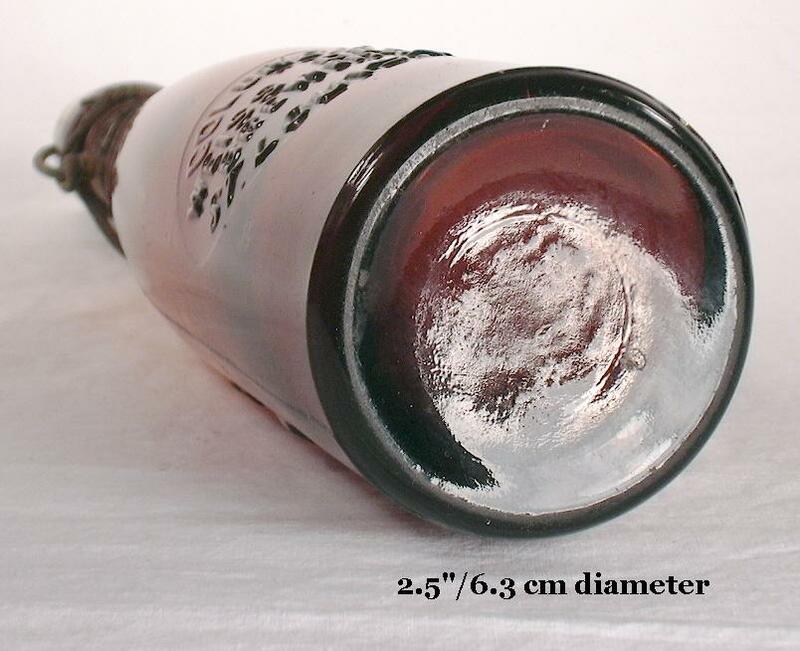 Click on the following links to view more pictures of this bottle: base view showing the markers markings and wear around the outside edge of the base from extensive re-use of the bottle; close-up view of the shoulder, neck, and finish. The large beer bottle to the right is a full quart size Steinie. It has features common to both the Stubbie and the Steinie, i.e., step-up bulging neck like the earlier Steinie example and a longer, more rounded lower body to heel area like the pictured Stubbie. This particular bottle was also made by the Owens-Illinois Glass Company at their Oakland, CA. plant - as indicated by the "20" to the right of the "diamond O-I" mark - in 1952 as indicated by the "52" to the right of the "diamond O-I" mark (Toulouse 1971; Lockhart et al. 2018t & 2018u). These similarly shaped, though larger size beers are not as commonly encountered as the shorter 11 to 12 oz. versions but were still very commonly used during the era. Quart size bottles with the stubbie shape were also apparently made (Lockhart pers. comm. 2006). Dating Summary/Notes: Both the Stubbie and Steinie styles appear to have originated just after the end of National Prohibition making their first appearance in 1935 and 1936, respectively. Both styles were used commonly through the 1940s. By early 1950s the Steinie style (the 11-12 oz. sizes anyway) seem to have become less popular and the classic Stubbie shape dominant, likely even being more popular than the export style at that time (Schulz et al. 2019; empirical observations). For additional images of various labeled beer/ale bottles click the following link to view the pertinent section of the Labeled Bottles page. Again it must be stated that the category of bottles covered on this webpage (Beer/Ale) is very large. Like all of the bottle "typing" (typology) pages connected to the main Bottle Typing/Diagnostic Shapes page, this page just scratched the surface as to the total diversity of these bottle types. It does, however, cover the primary styles that were most commonly used and encountered within an archaeological context. This page has also somewhat emphasized mouth-blown bottles since that subject is of more familiarity to the author of this website than later 20th century, machine-made items. However, though the automated bottle production era also had incredible variety, it was not as diverse as the mouth-blown era since shape standardization and simplification was typical of machine manufacturing. Also, bottle body embossing became much less frequent on machine-made bottles and a significant amount of the diversity of the mouth-blown production era was the different proprietary embossing on essentially the same shapes of bottles.